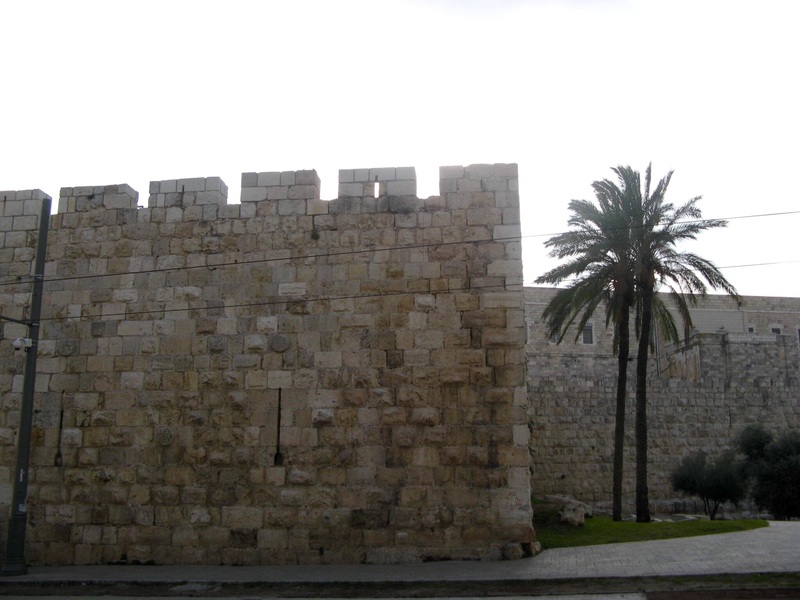 1/28 – In the morning, we walked through the Jaffa Gate into the Christian Quarter of the Old City of Jerusalem. 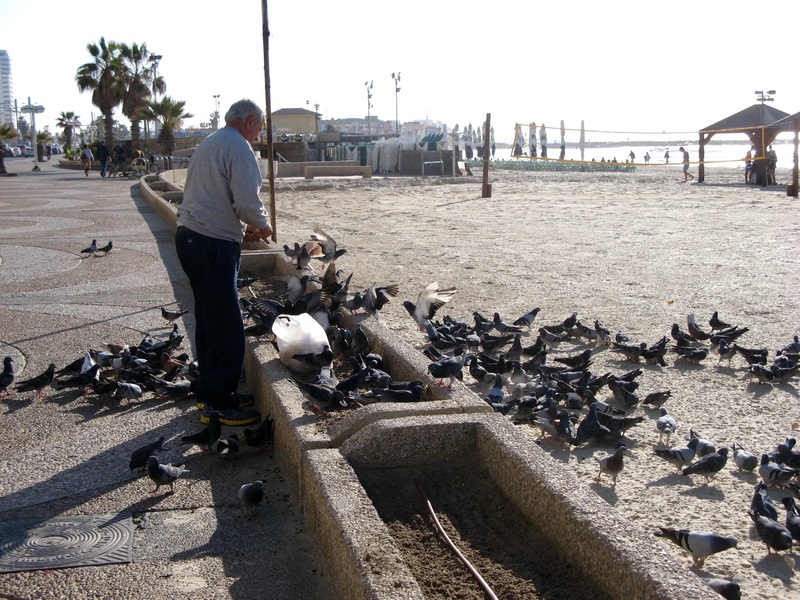 I read a book about how crowded the Old City was, and was prepared for a crush of humanity. No crush – we strolled right in. What was the first thing we saw? A Christmas tree and Christmas streetlights! This is a holiday that just won’t quit. 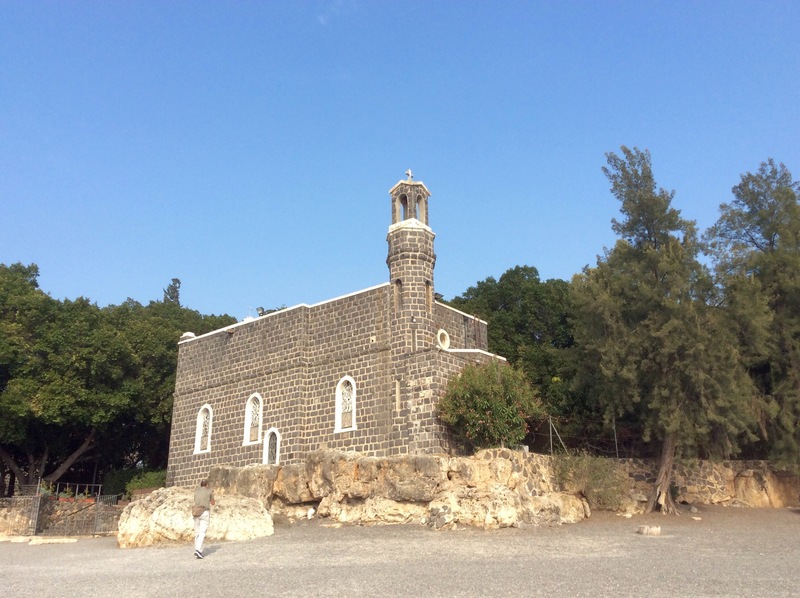 We are soon at the Church of the Holy Sepluchre, built over a temple to Aphrodite on the site where Jesus is believed to have been crucified. (Thanks again to the Emperor Constantine and his mom, St. Helena.) 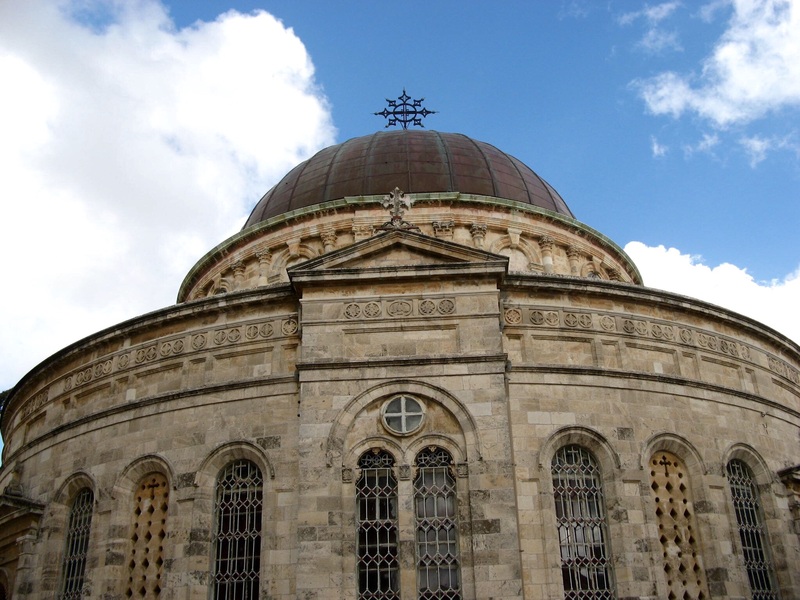 The church is a mix of Greek Orthodox, Russian Orthodox, Roman Catholic and Armenian elements. 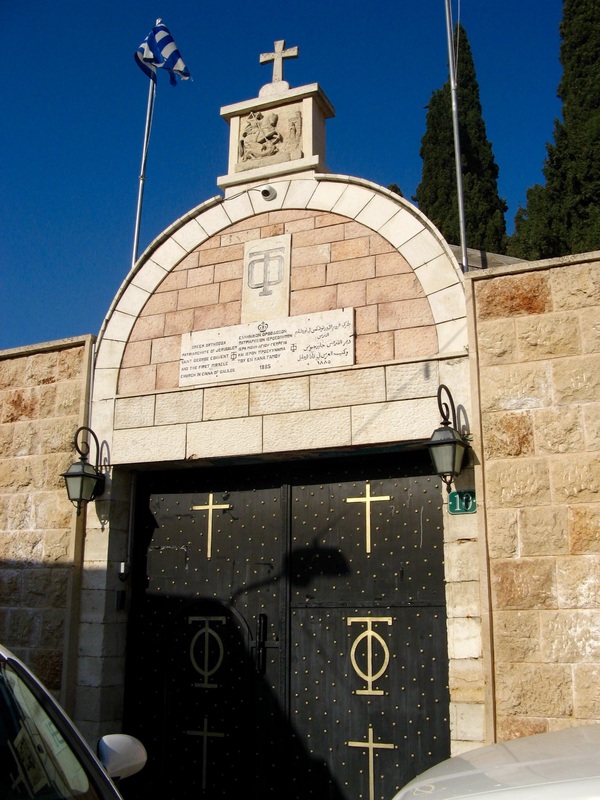 The final stations of the cross of the Via Dolorosa are in this church. 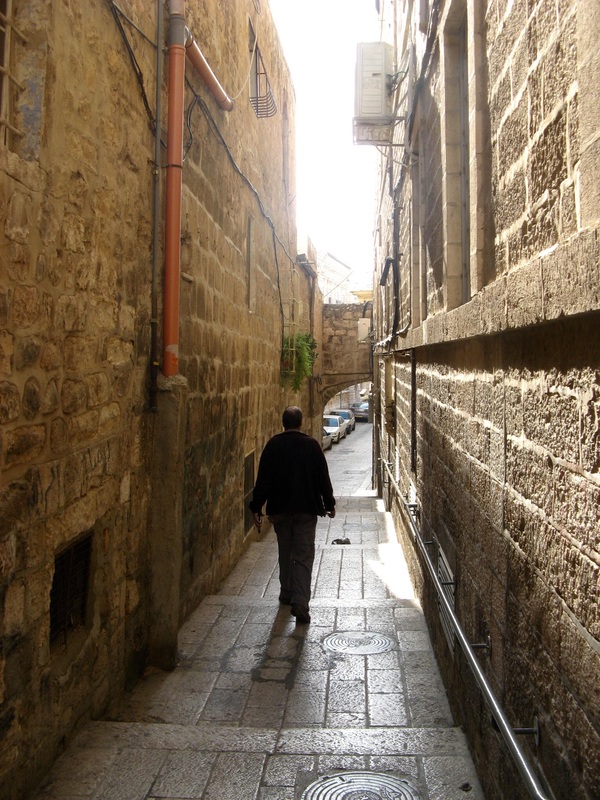 (The Via Dolorosa starts in the Islamic Quarter, and is a stone paved narrow street like all the others. Don’t know what I was expecting – a dirt road? A hill? Something outside the center of the city, I guess.) 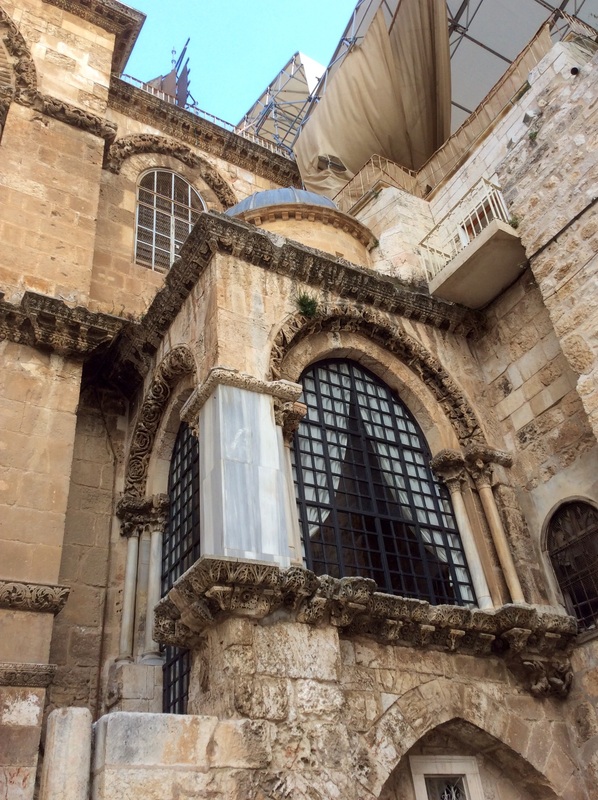 Outside is a chapel that marks where Jesus was stripped of his clothes. 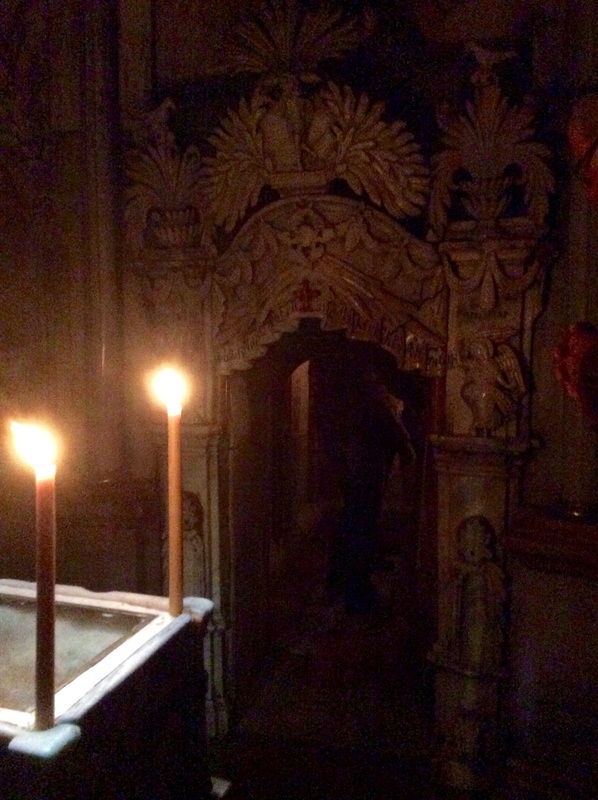 Just through the door is the Stone of Unction or Anointing, where Jesus’ body was laid when he was taken down from the cross. 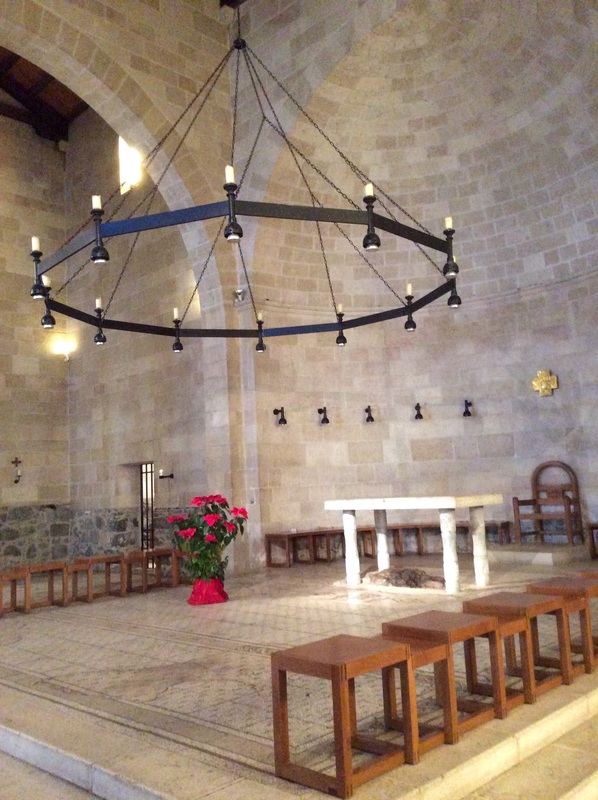 Here was the place of crucifixion. 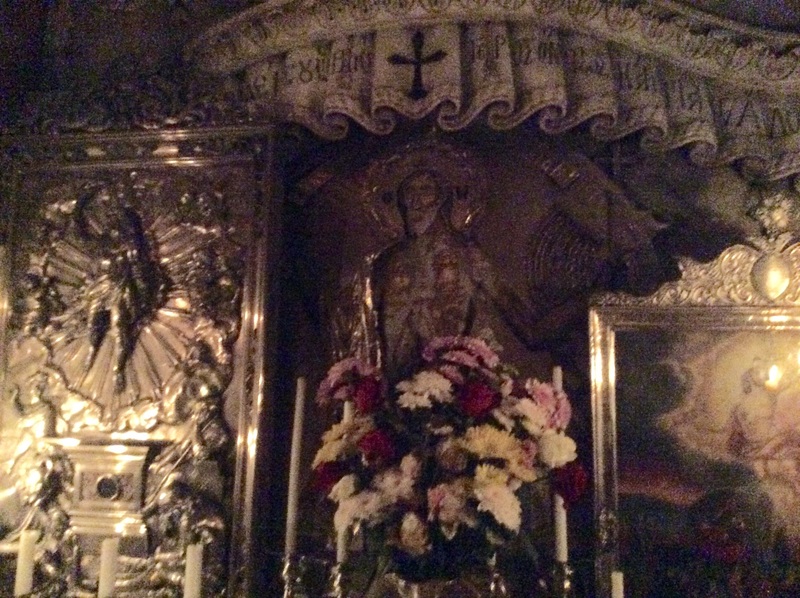 We queued up to enter the tomb, a very dark, small space filled with gold, where you had to bend or kneel to enter. Only five people were allowed in at a time, and there was a priest standing outside keeping the line moving. 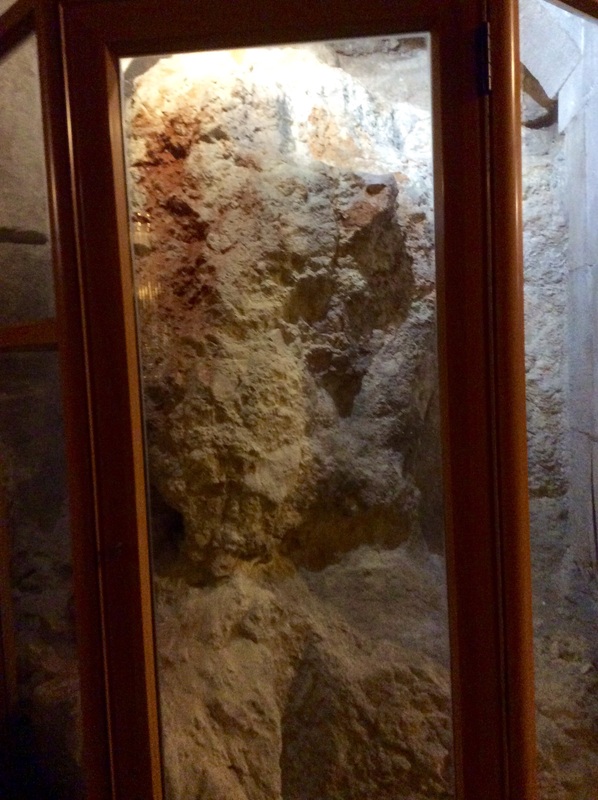 There is the stone at the place of crucifixion, and another stone in a glass case. 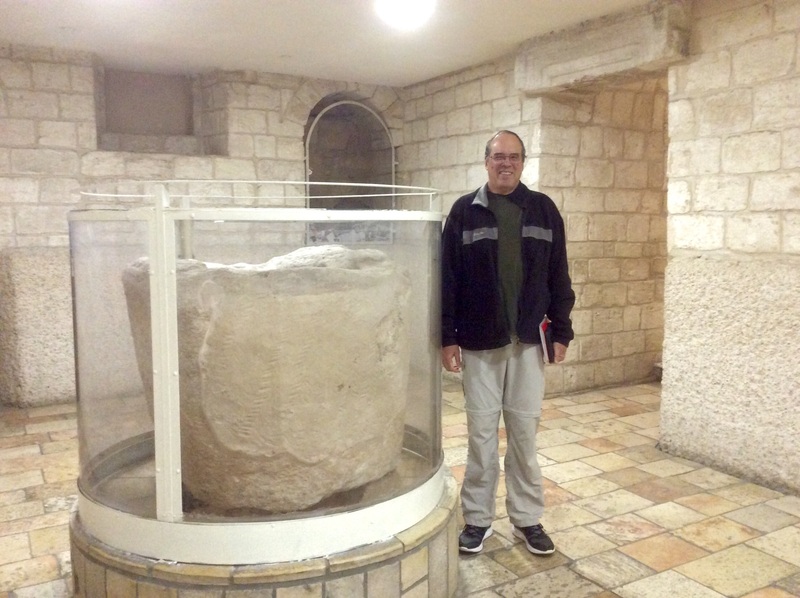 Could one of them be the stone that was rolled away from the tomb? I wish there was more signage. 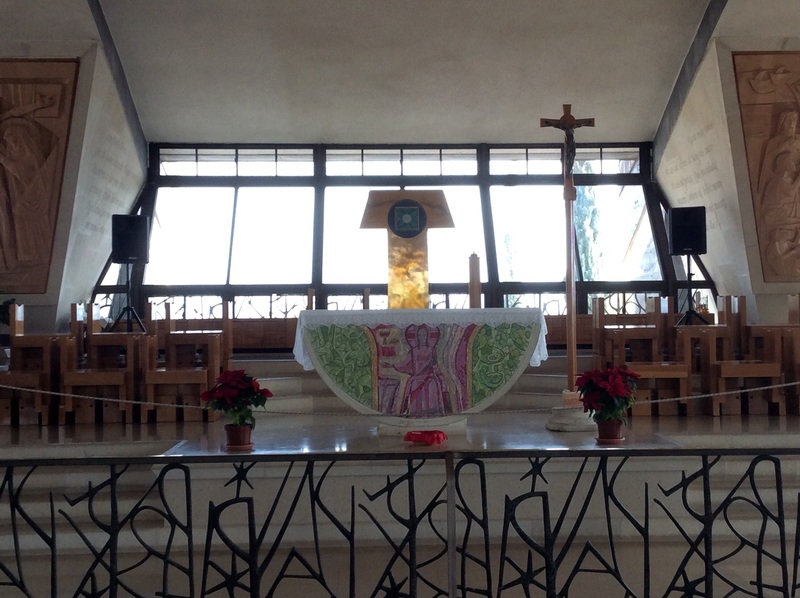 Here are some other images from the church. The walls are marked with small crosses by the pilgrims who traveled here. I have to say that this church had lots of gold and glitter, but it did not feel like a holy place to me. Sometimes, all the tourists jostling with their Selfie Sticks just make me sad, although I am no better, trying to capture images for this blog. It was hard to imagine what these objects had to do with the Crucifixion. We actually left the church, bought a book (from a Muslim shopkeeper) to explain what we were seeing, then went back in and walked through again. There was no place to sit and contemplate, which I guess I missed. 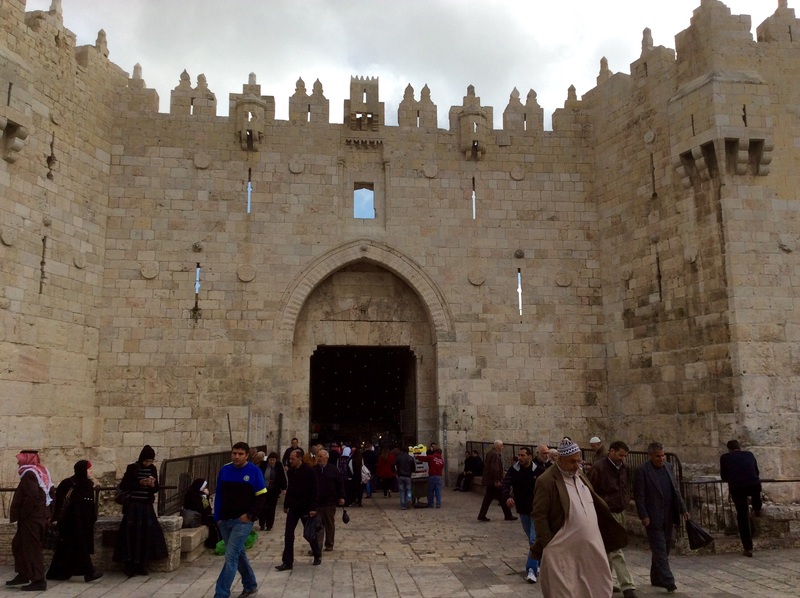 We walked from the Christian quarter to the Jewish Quarter, to visit the Western Wall of the Temple Mount. We had to go through a metal detector and security check to enter. The sign said that God’s presence is always here. The area has separate entrances for men and women. There were a lot more women praying today. 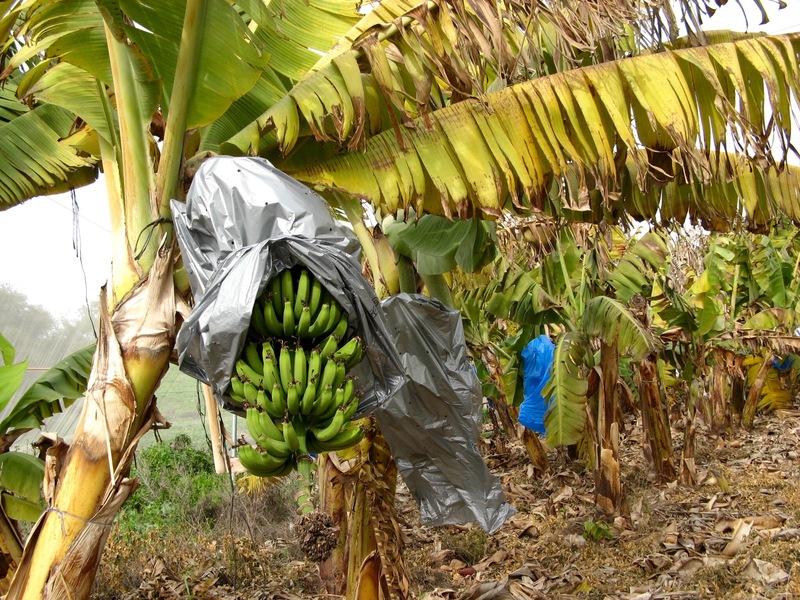 A sign asked that heads be covered appropriately. I tied on my trusty headscarf, then realized the sign was for the men! A box of paper kippas was provided so the men could cover their heads. 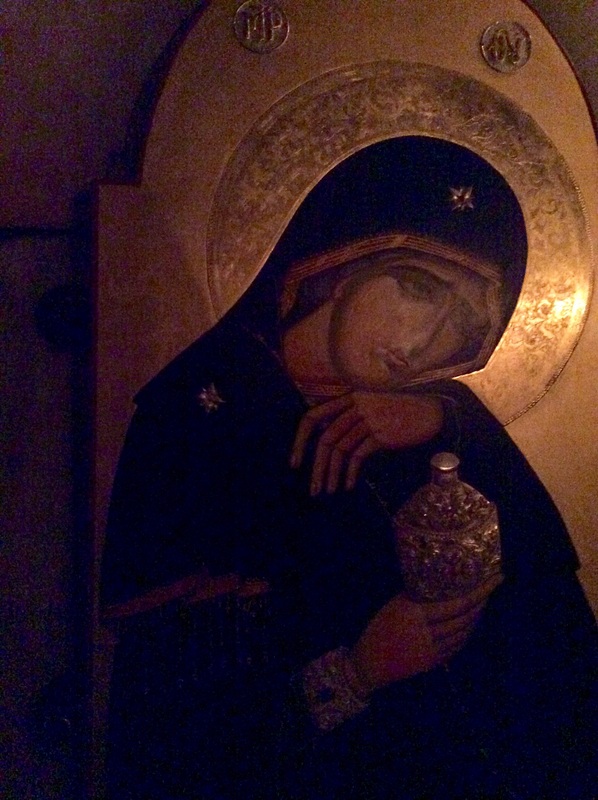 The women were bare-headed, reading from little books and rocking in prayer. Here you could sit or stand or touch the wall as the spirit moved you. 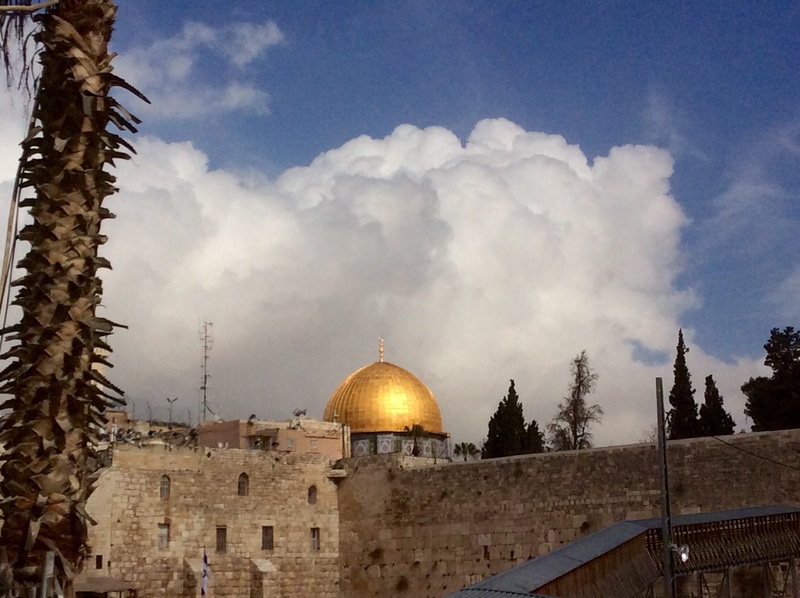 From where we stood at the Wall, we could see the Dome of the Rock in the Islamic Quarter. Unfortunately, the police were allowing Muslims only into the Islamic Quarter, as it was a time of prayer. 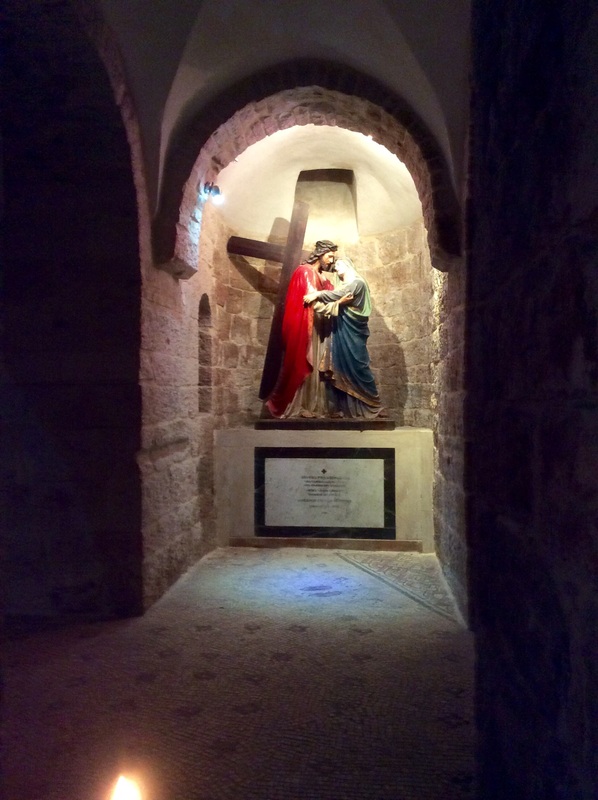 In the Armenian Church in the Armenian Quarter, we saw another station of the cross where Jesus met his mother. Look at the imprint of sandals on the mosaic floor that mark the spot. 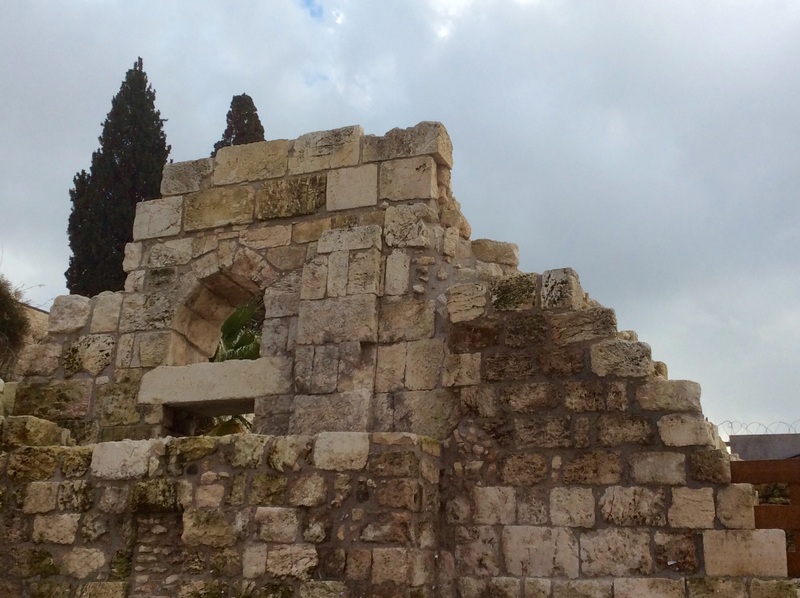 We left the Old City through the Damascus Gate, and walked across town to see the Garden Tomb. 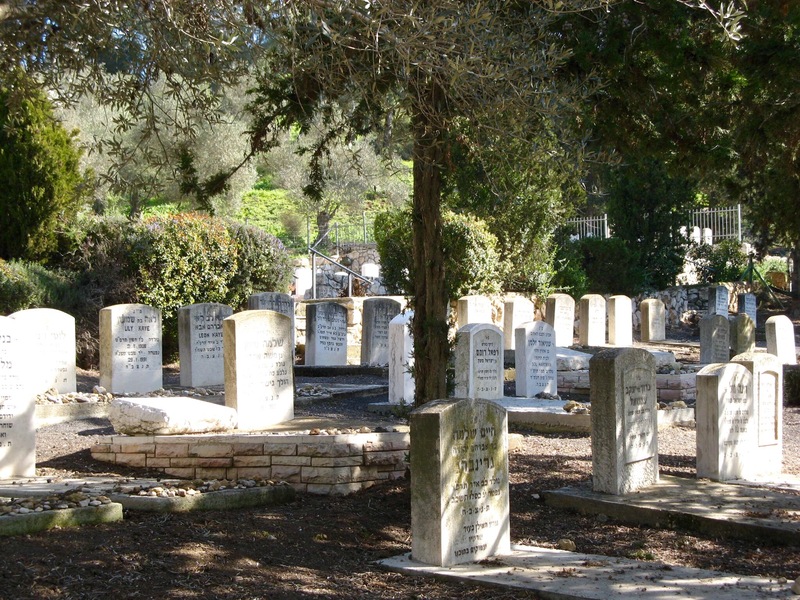 The Garden Tomb is a site run by Evangelical Anglicans, that offers a different theory on where Jesus was crucified and buried. 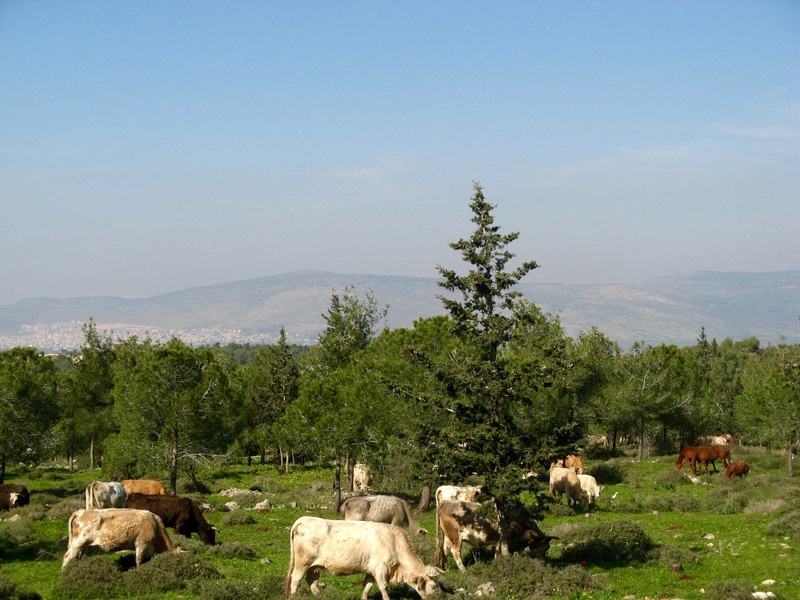 The land is thought to be the garden owned by Joseph of Arimathea. 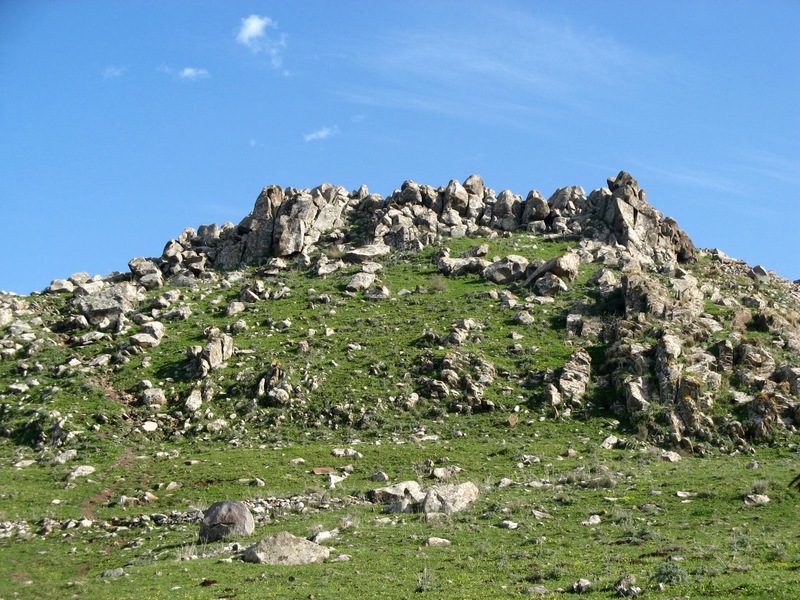 It sits within sight of the Hill of the Skull, thought to be Golgatha. 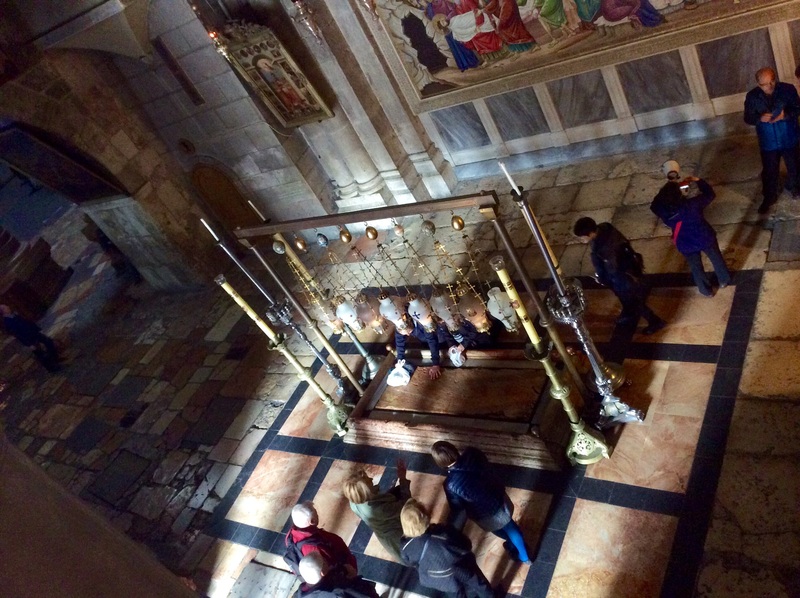 The message was emphasized that it matters not where Jesus died, but WHY. There was a tomb carved from a cave, and a wine press. It felt more like a holy place to me. 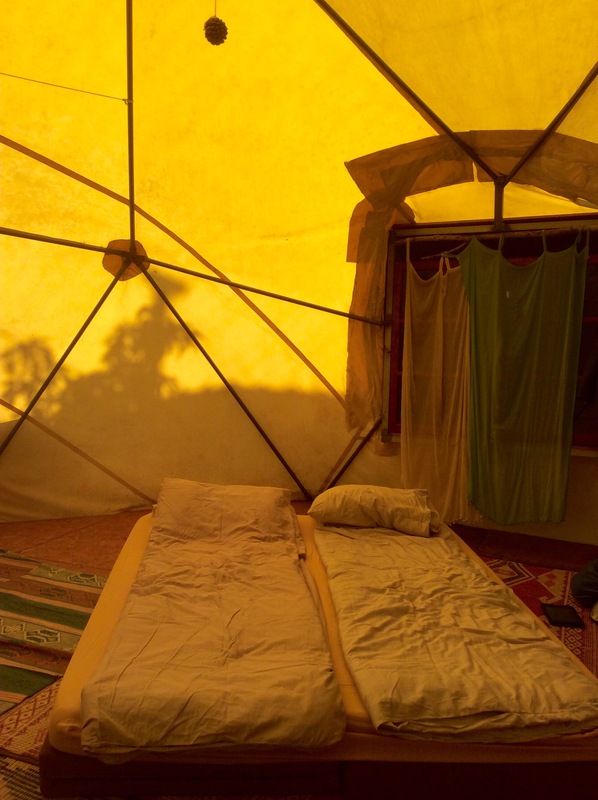 A peaceful, contemplative experience. I’m very glad we visited here. On our way home, we saw a sign for an Ethiopian Church, so we removed our shoes and peeked in. A long day with many images to ponder. 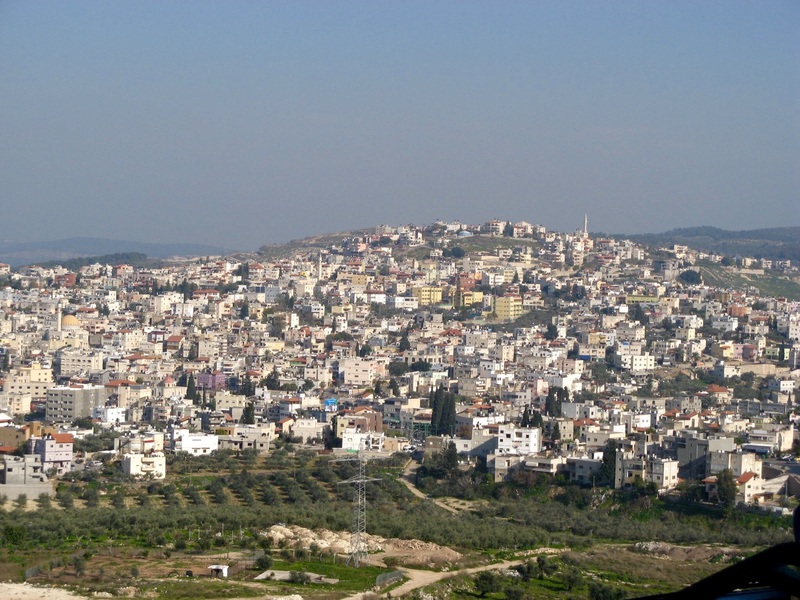 1/27 – We checked out of our room at Karei Desche, took a taxi to Tiberias, and caught the 10am bus to Jerusalem, a three hour ride. 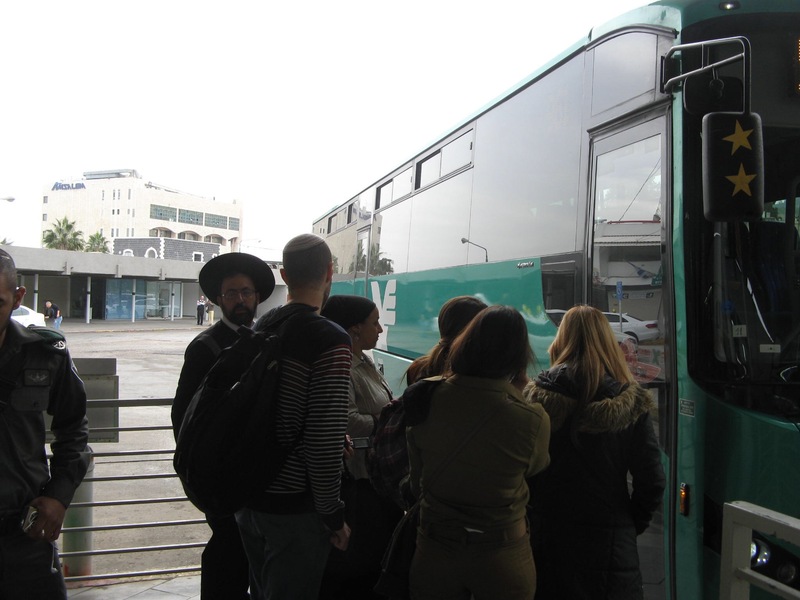 We shared the bus with many young Israeli soldiers in uniform, who ride for free. All 18 year olds serve in the military here; the girls for two years, and boys for three. It was a little unsettling to see kids with semi-automatic rifles slung over their shoulders on the bus. 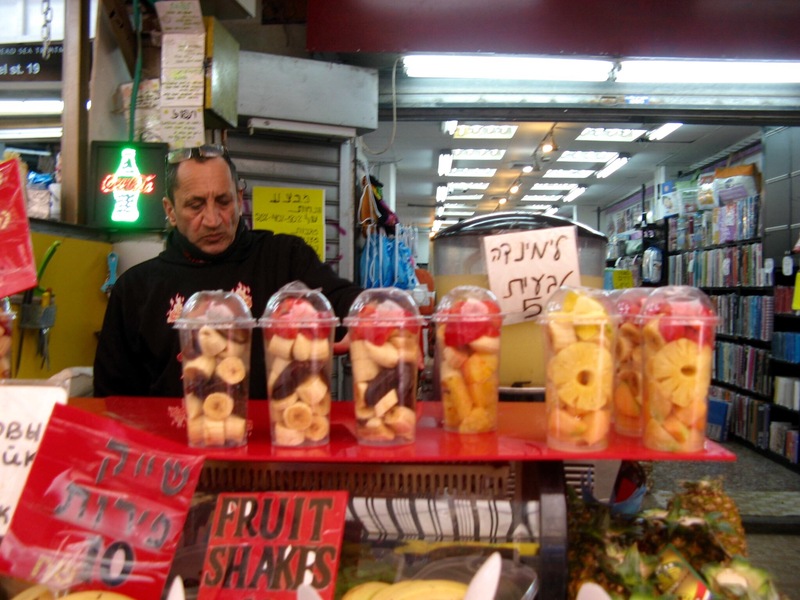 We walked down the bustling, modern, and very clean streets, and I came across something I haven’t seen since Wisconsin. Wall art! 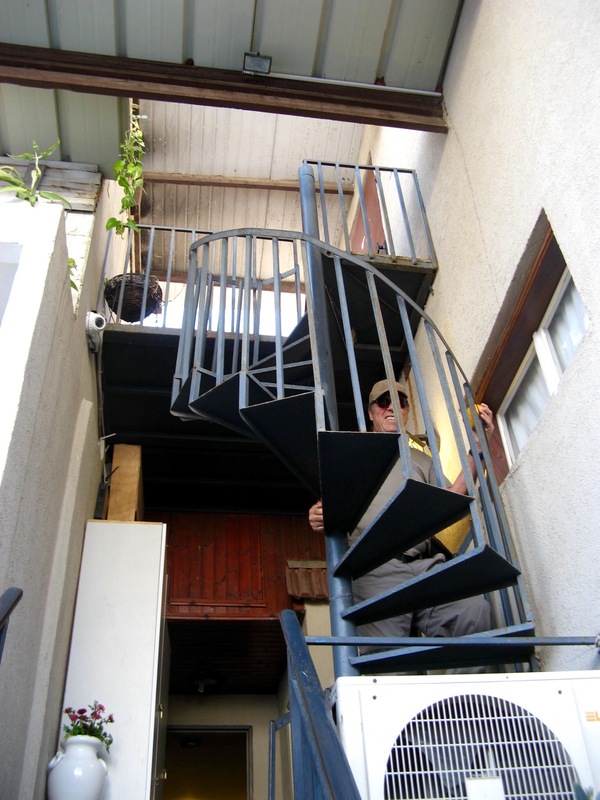 We are staying at a cozy flat advertised as A Cozy Flat in Jerusalem. The owner left us the key in a lockbox, and asked us to leave our payment on the kitchen table when we left. Very relaxed arrangement. 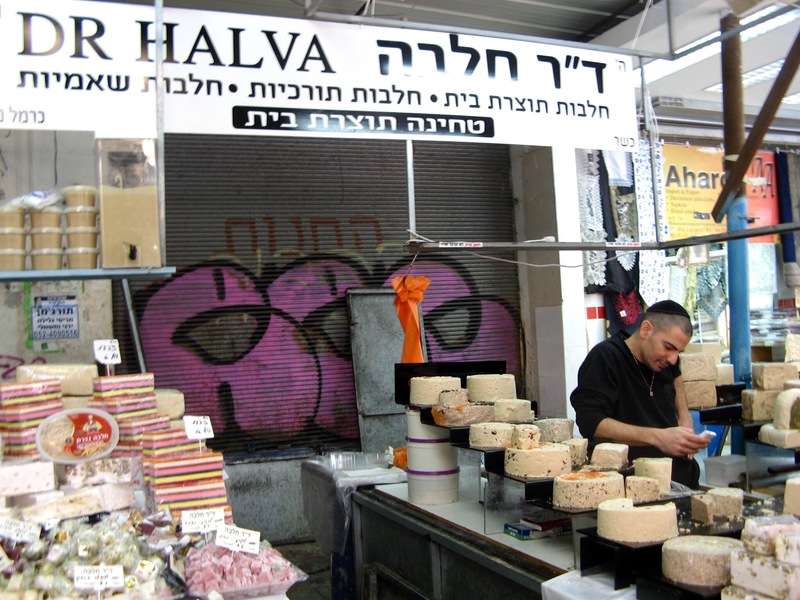 Our flat is at Jaffa Center, a very upscale shopping district not far from the walls of the Old City. 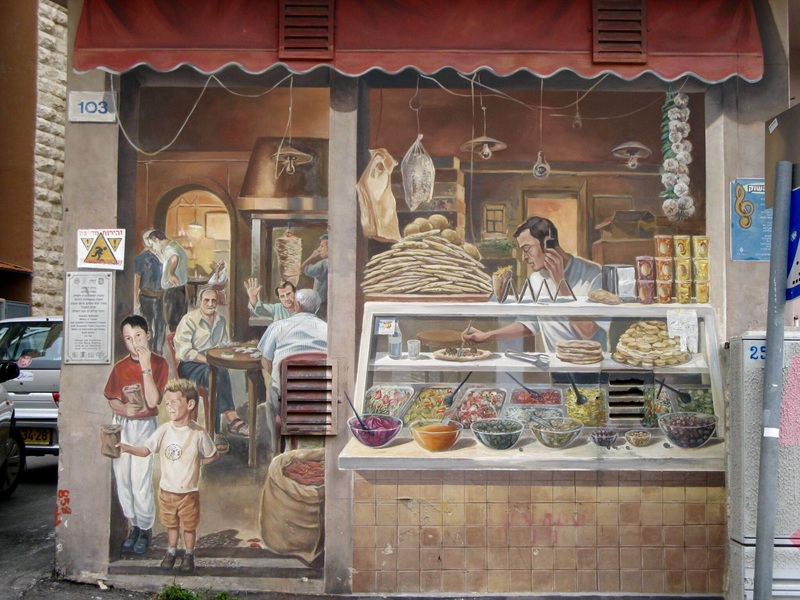 Although we were surrounded by shops, we couldn’t find a market to buy provisions for supper. 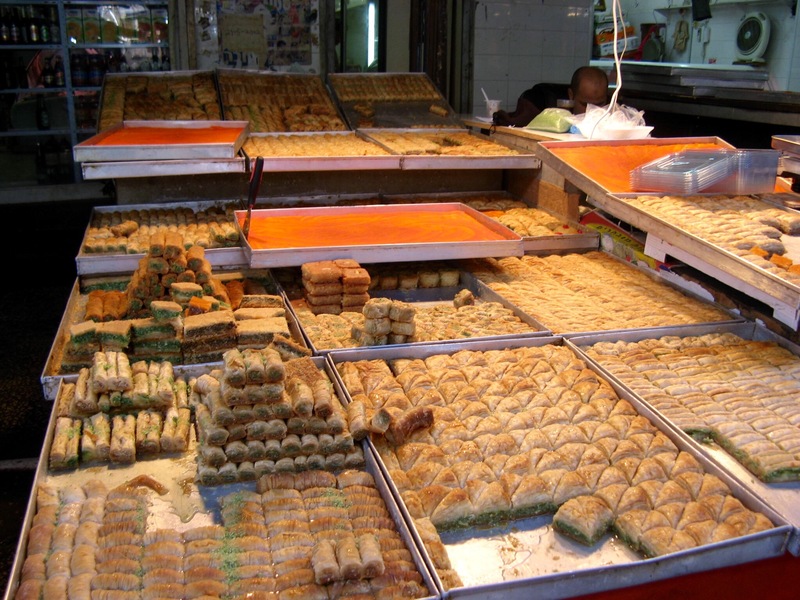 When we finally asked, we were directed up the main street about 15 minutes walk, where we found a bustling open-air market. Jim fixed us the best chicken soup ever. 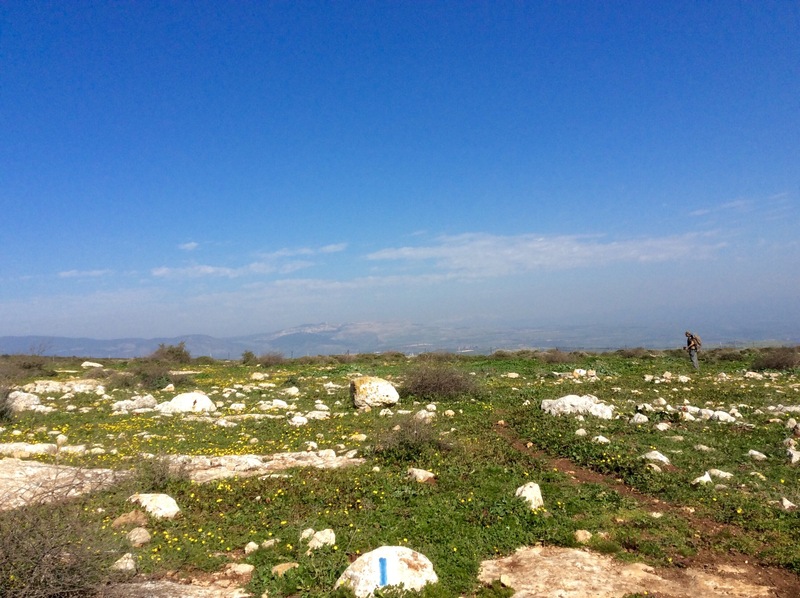 We are walking the Jesus Trail in Israel — from Nazareth to Capernaum. 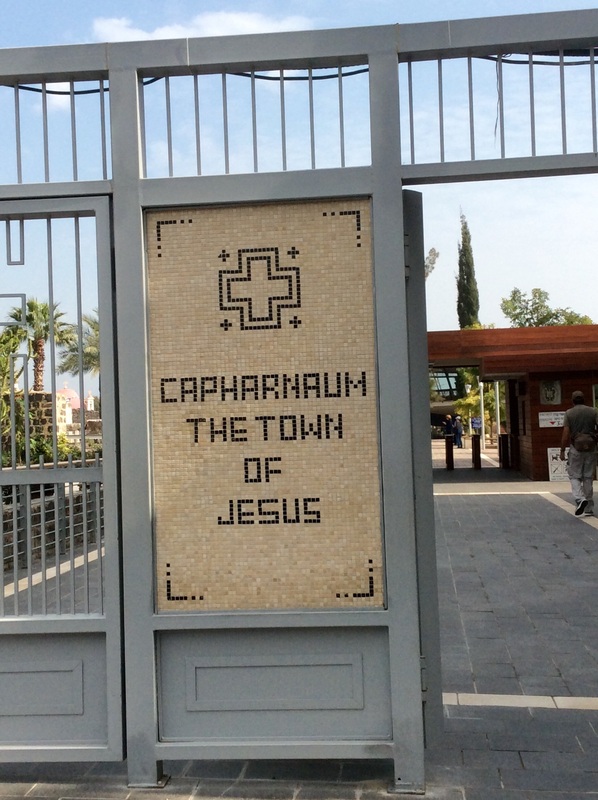 In Tabgha, we see the first sign for Capernaum, our ultimate destination, the location of St. Peter’s house and the Orthodox Church of Capernaum. 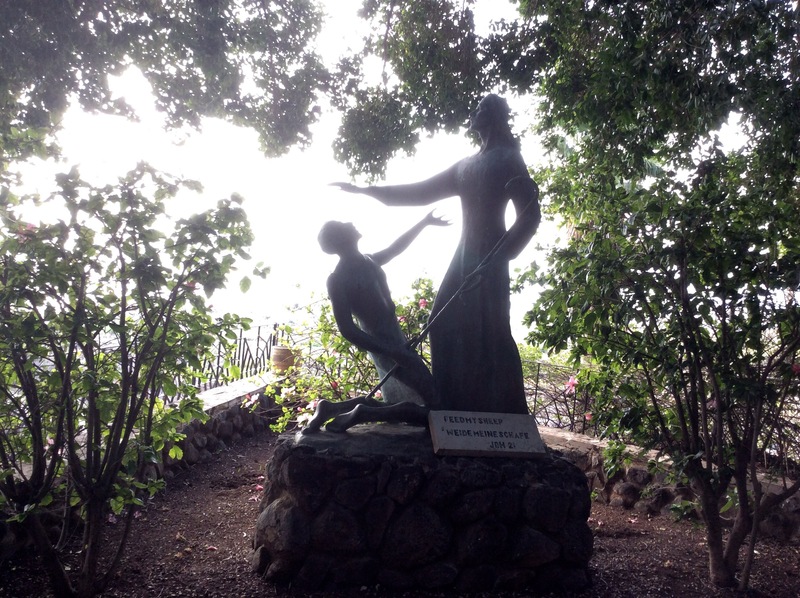 1/26 – Down the road from the Church of the Multiplication, is the Church of the Primacy of St. Peter. 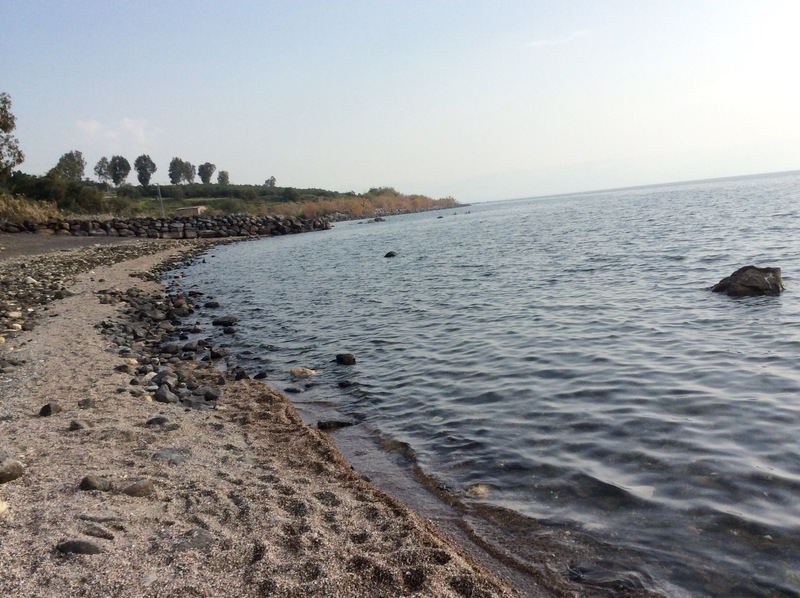 It is right on the Galilean shore. 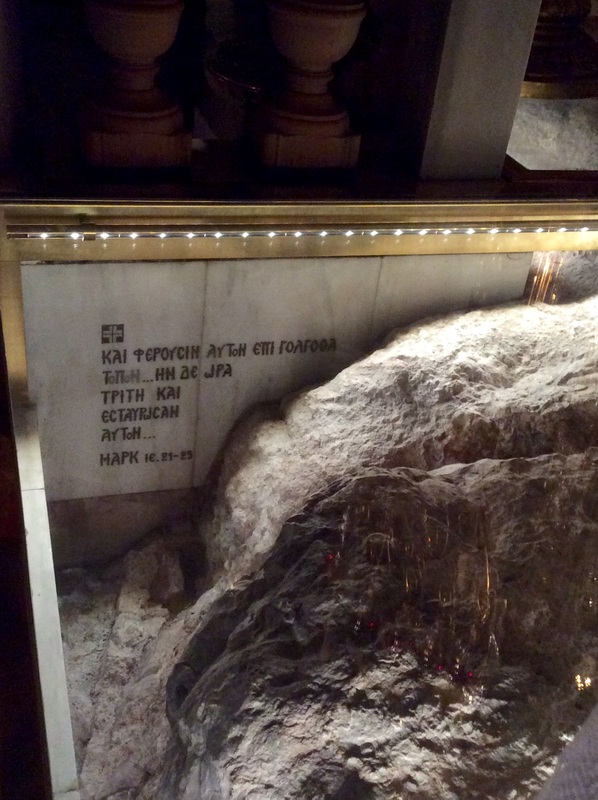 This church also has a big rock where Jesus is thought to have blessed the loaves and fishes. 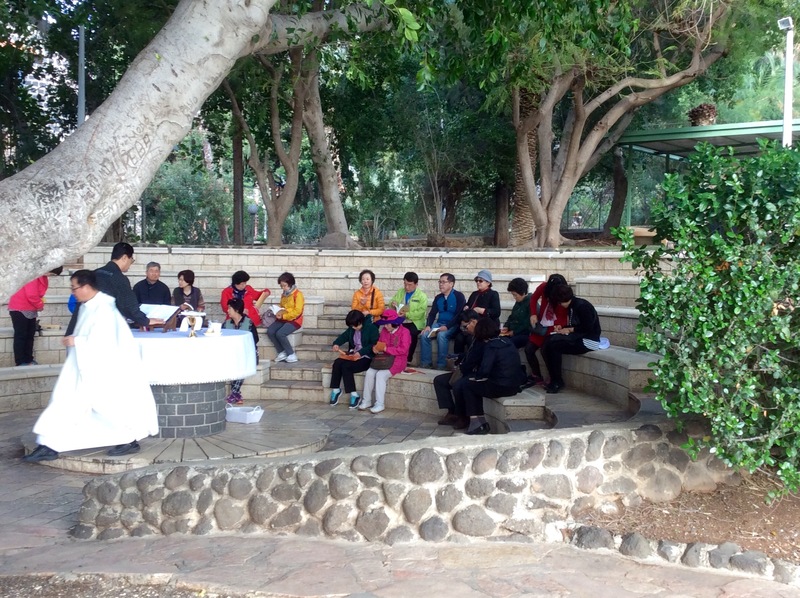 There was an Asian group conducting a mass in one of the outdoor chapels. We listened to them sing as we gazed at the shore. 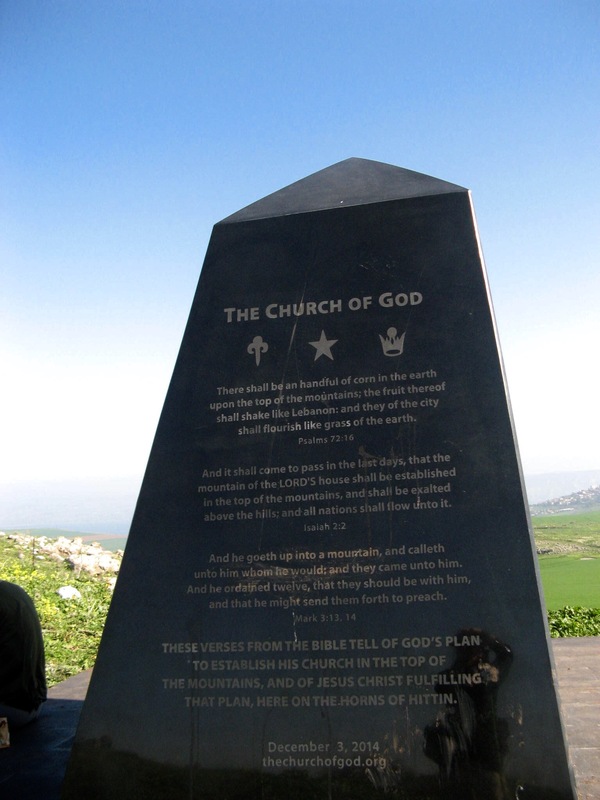 From here we hiked up a big hill to reach the Church of the Beatitudes, where Jesus delivered his Sermon on the Mount. We could imagine the hill filled with people as we climbed in the morning sun. This was very small church jam-packed with tour groups, surrounded by a contemplative garden. The nuns also run a guest house here. We tramped back down the hill, cutting through farmers fields and hopping over a barbed wire fence to get back to the main road. 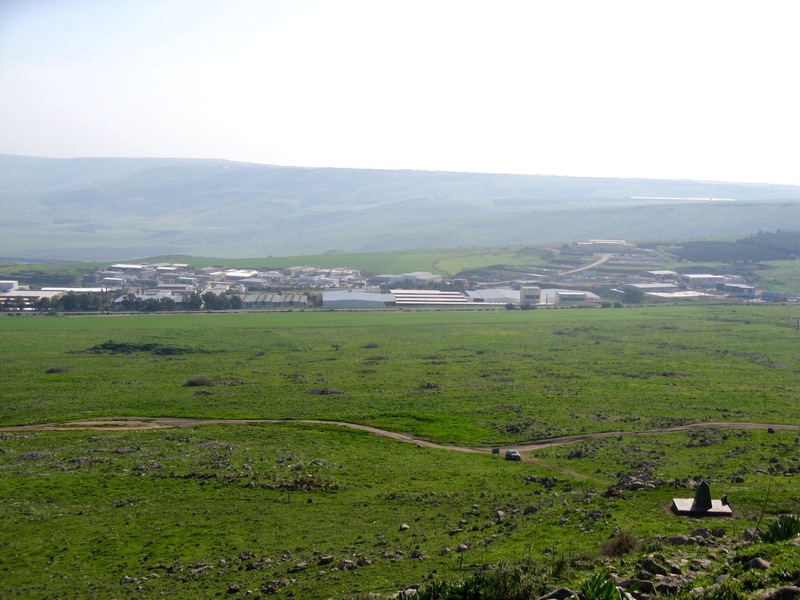 Now to walk to Capernaum. 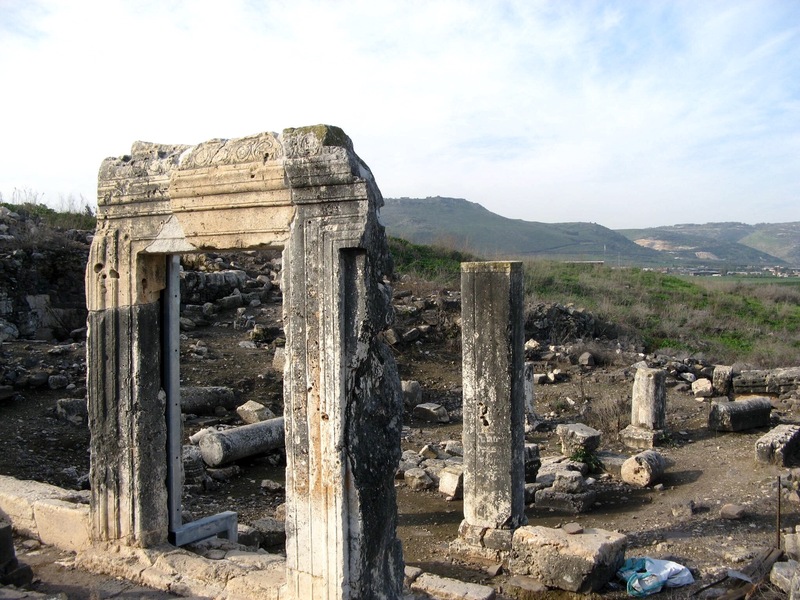 Capernaum, pronounced Cap-har-NAY-um by the locals, is not a town, but another ruin with monuments. 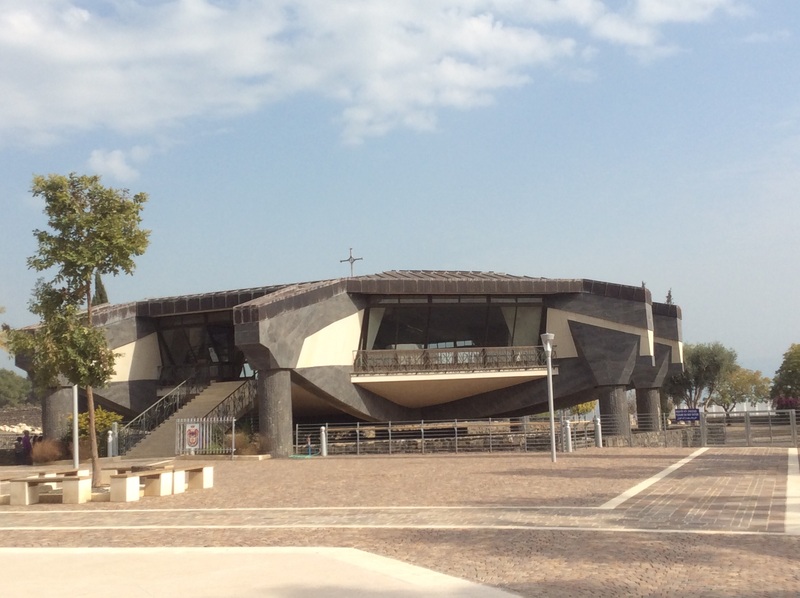 Here, a house believed to belong to Peter is preserved under a very modern church that looks like a UFO. You can see the excavation under the glass floor of the church, and from the outside. 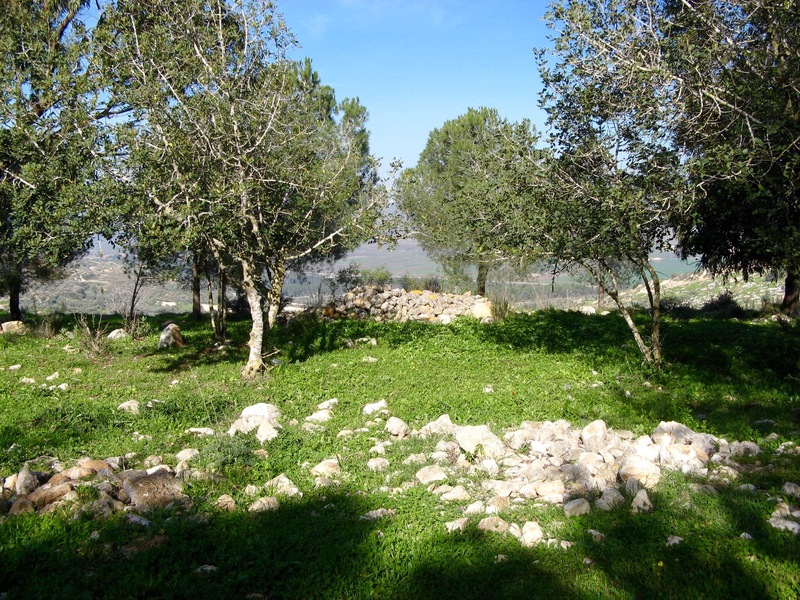 This particular house was maintained much longer than the other houses nearby, and had many oil lamps, which could mean it was used as a meeting or worship space instead of a dwelling. That’s why it is believed to be Peter’s house. 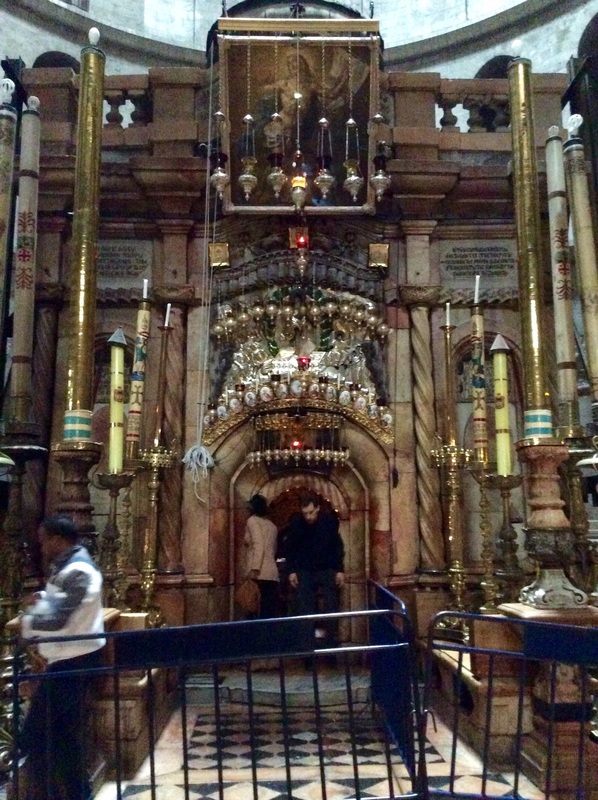 There is also a reconstruction of a large ancient synagogue here, where Jesus is said to have preached. 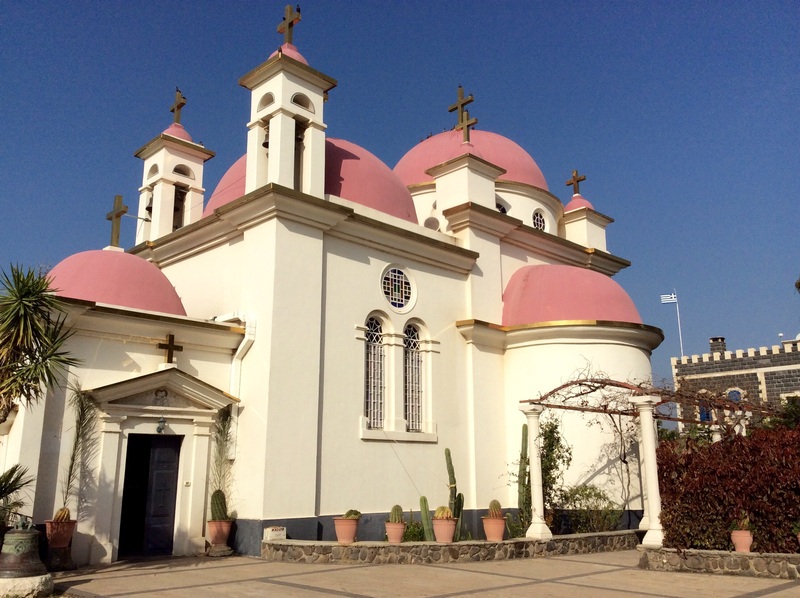 Our last hike of the day is to the pink-domed Greek Orthodox Church of the Twelve Apostles. There are peacocks in the yard, and beautiful old trees. 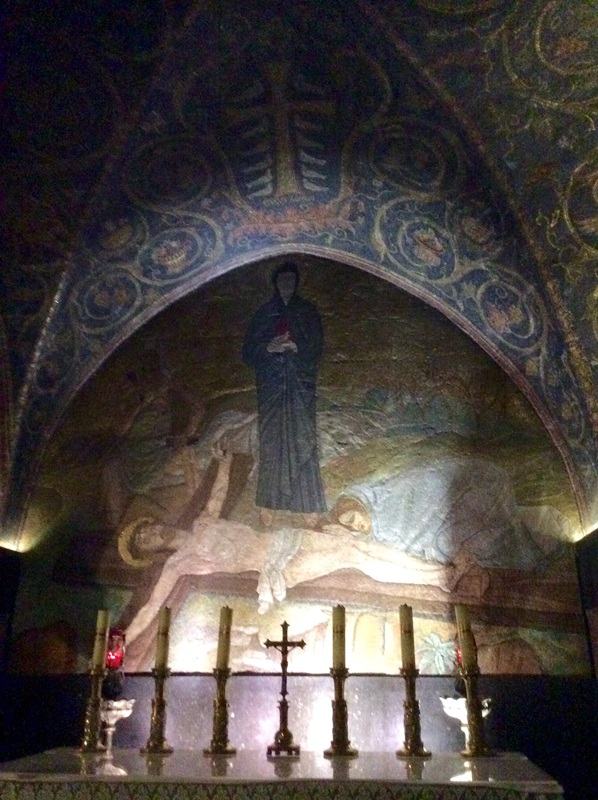 Inside, a repeating chorus of Hallelujahs surround us as we took in the frescos on the walls and ceilings. A fitting end to a wonderful day. 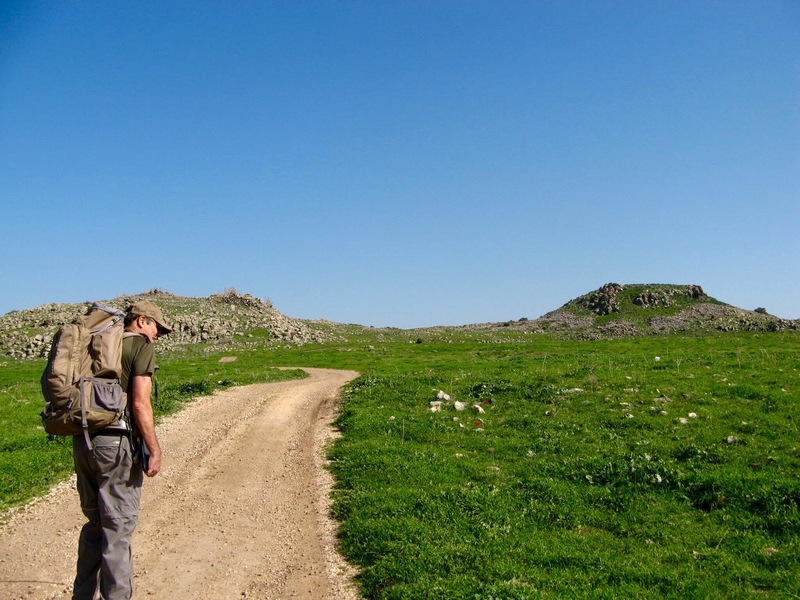 We leave the Arbel Guesthouse to walk to Tabgha, Israel, continuing our hike on the 40 mile Jesus Trail. 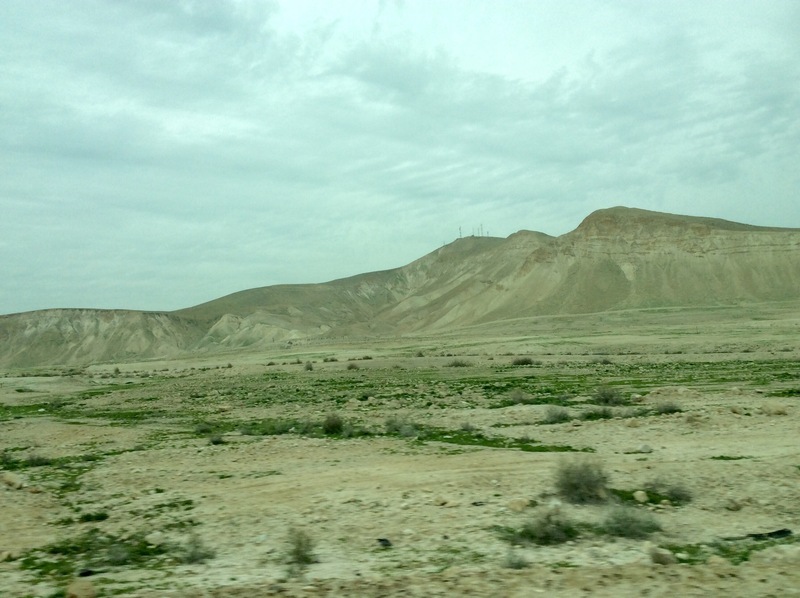 We pass the ruins of the Roman/Byzantine Synagogue of Ancient Arbel, one of the oldest synagogues in the world. 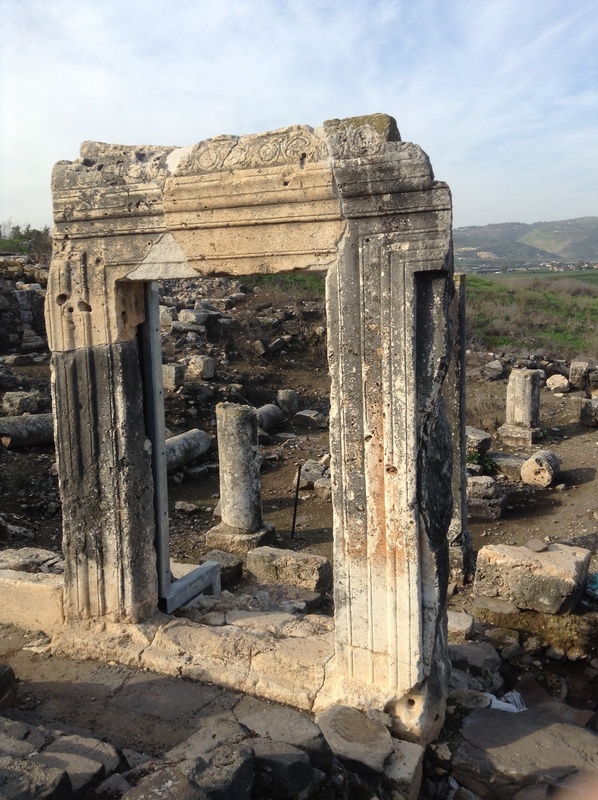 The synagogue door, carved from a massive natural limestone outcropping, still stands. 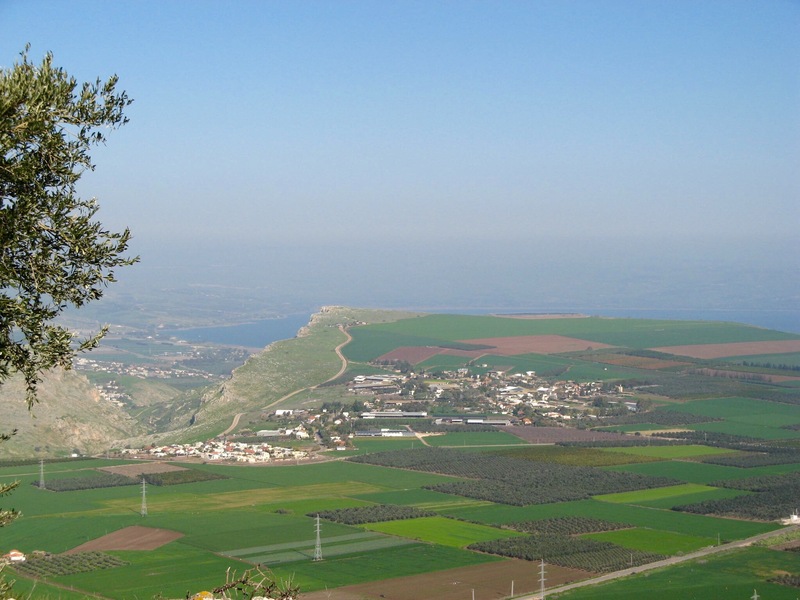 The synagogue has a view of the Arbel Valley, where, according to one Jewish tradition, the Messiah will appear. 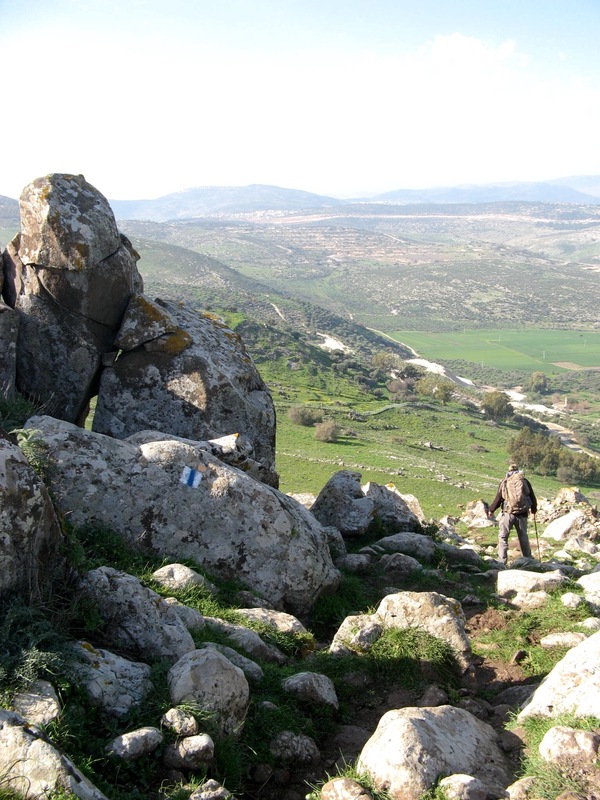 We take the Gospel Trail through the valley rather than walk down the steep Arbel cliffs. We encounter many cows along the trail. 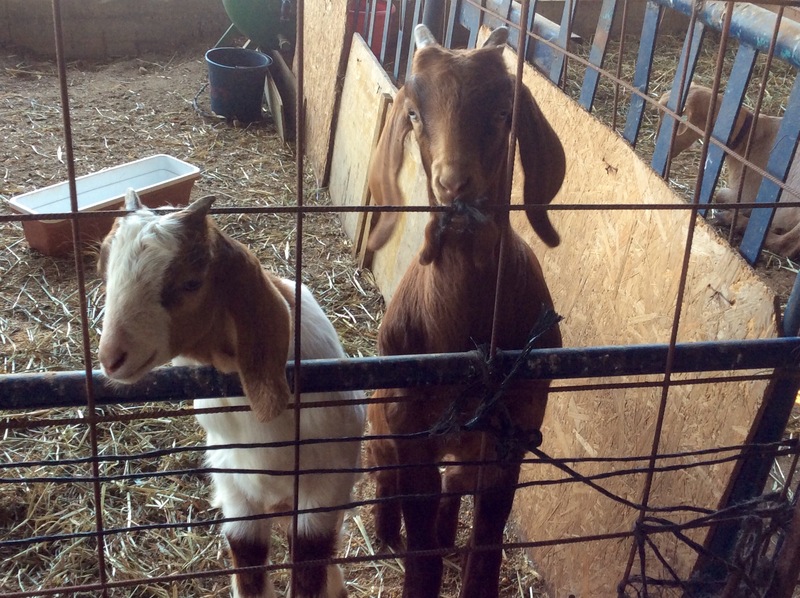 1/25 – So sorry I didn’t get a pic of our wonderful supper last night – we were too busy eating. Here’s a small part of what we were served for breakfast, including a baked tomato omelette, fruit, cheese, homemade bread, warm marmalade, muffins, avocado, tomatoes, peppers, cucumbers, olives, candied citrus, a fruit smoothie, herbal tea and coffee with whipped cream. Ate ’til we were stuffed again, and then made sandwiches for lunch. 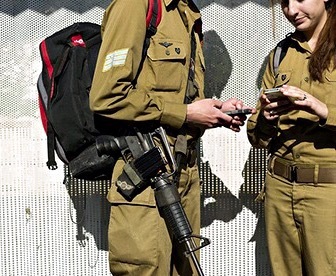 Bravo Israel! 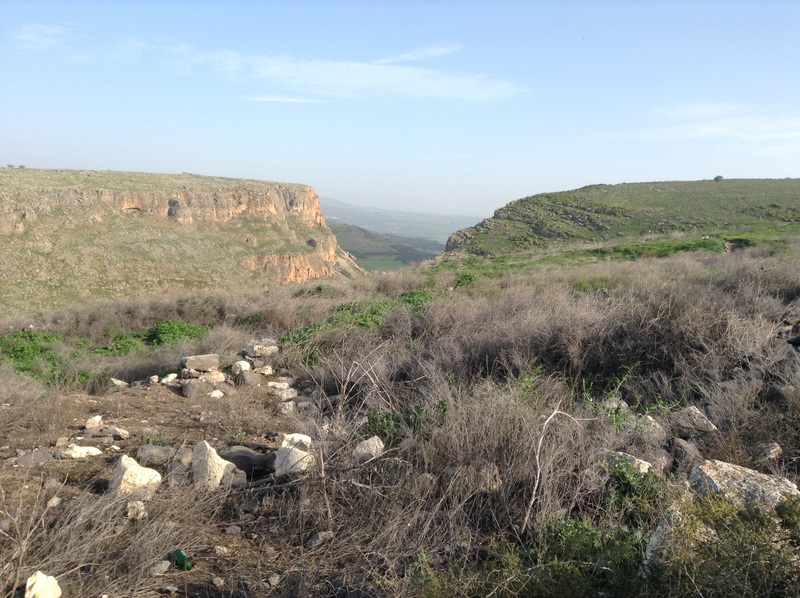 Back on the trail, we came upon the ruins of an ancient synagogue, discovered in 1905. 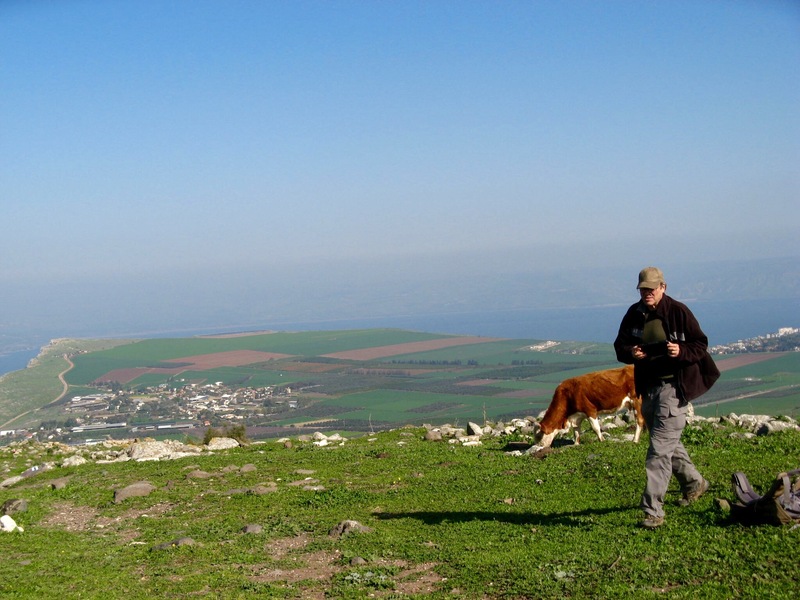 We walk near the cliffs of Arbel, and can see the Sea of Galilee in the distance. 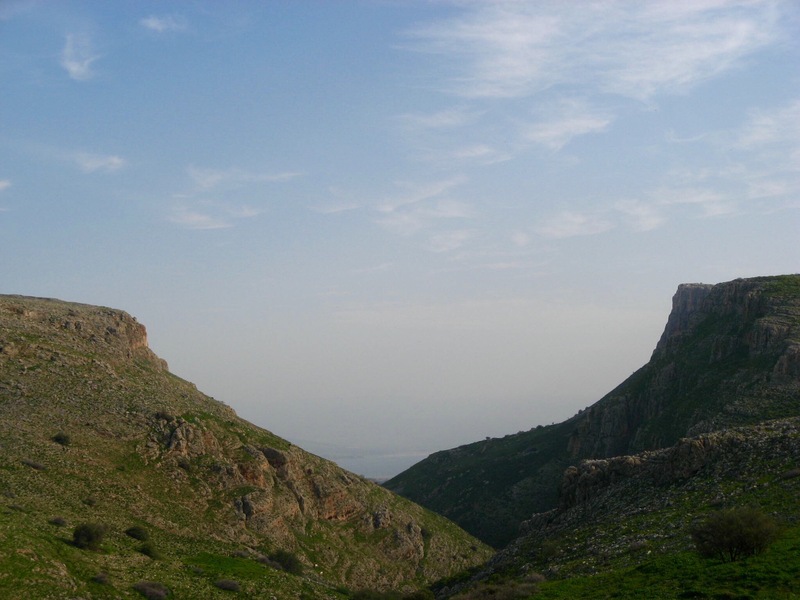 There are caves in the cliffs where bandits lived in Jesus’ time. 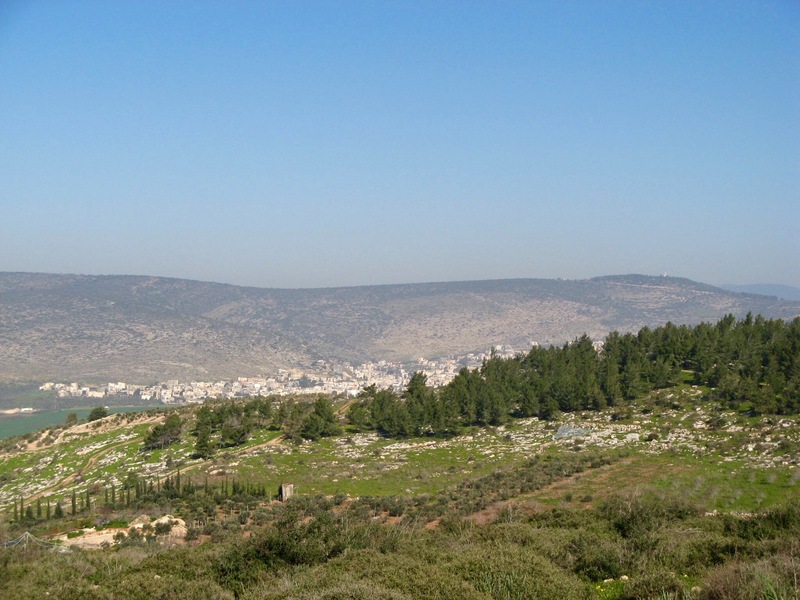 King Herod had to send troops to get them out of the caves, so travelers could proceed unmolested. 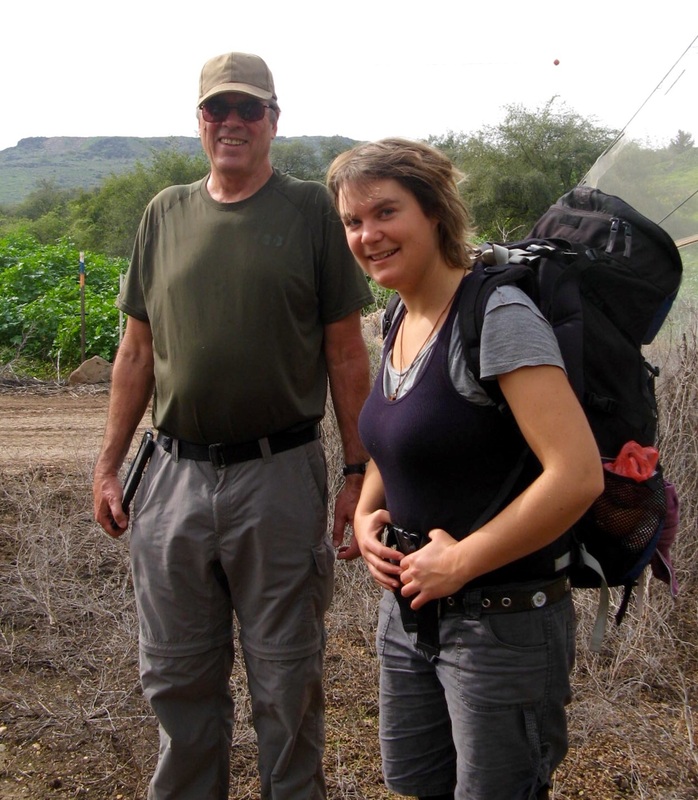 We met a young German girl named Mieke, who was also following the Jesus Trail. She became our companion for the day. 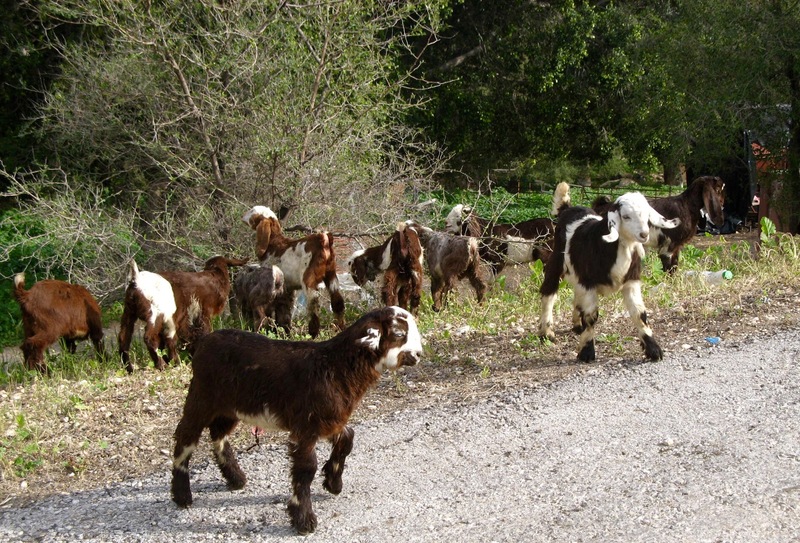 We also met some baby goats, out for a stroll with no one to mind them. 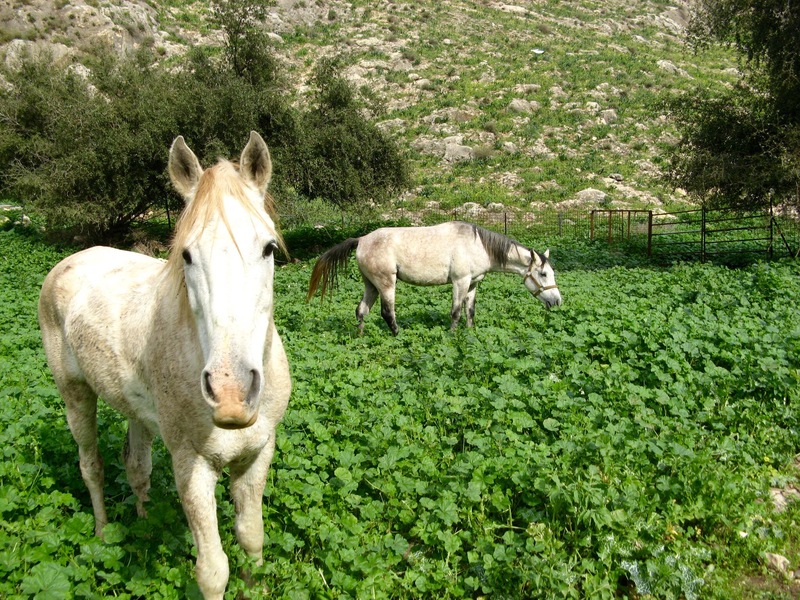 …some horses, up close and personal. 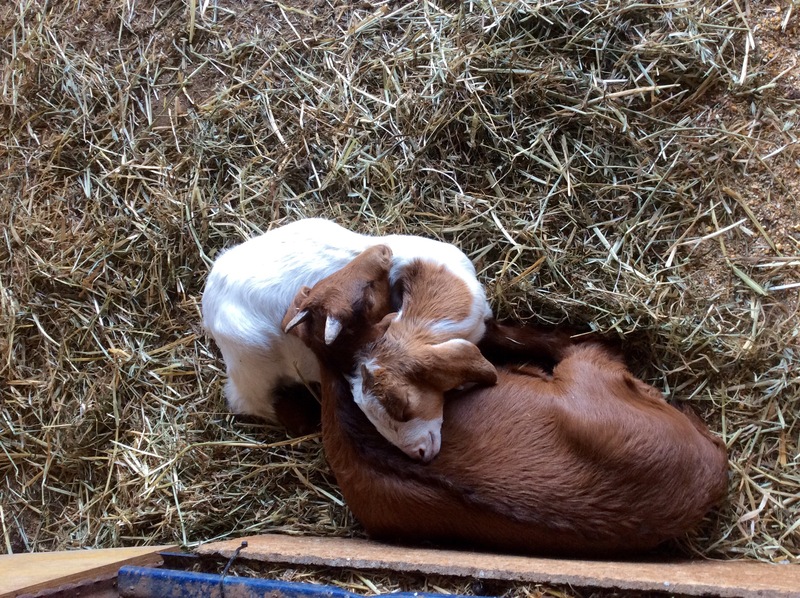 And, of course, some mama cows and baby cows. 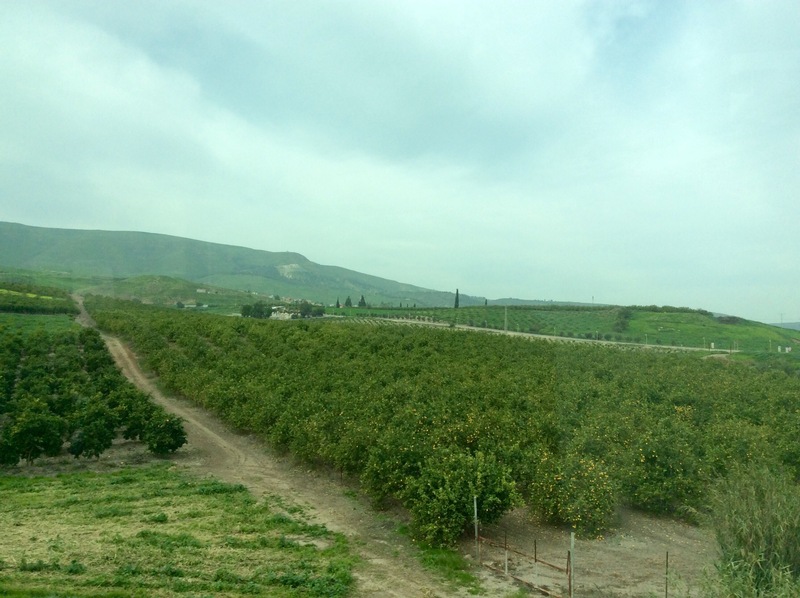 We walked through groves of citrus (the grapefruit was yummy), carob, olives and bananas. 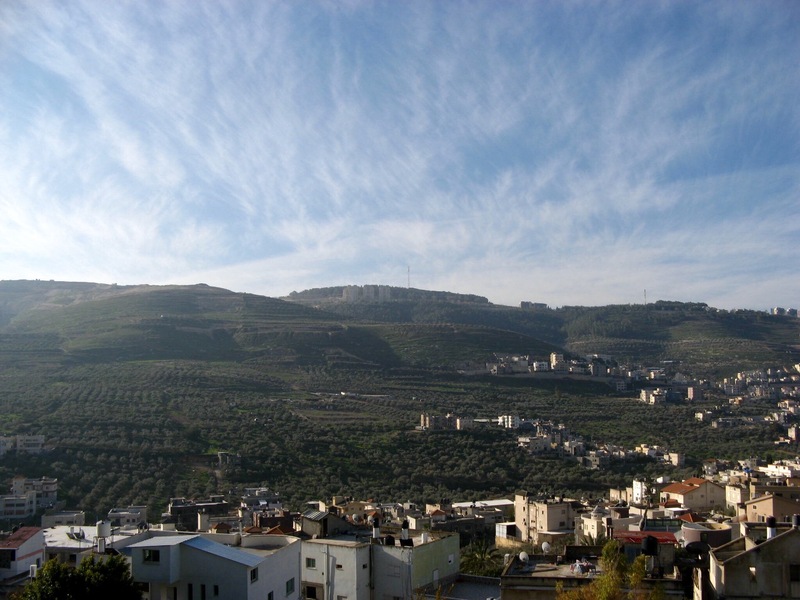 By mid-afternoon we arrived at Tabgha, which is a variation of the Greek name Heptapegon, meaning Seven Springs. 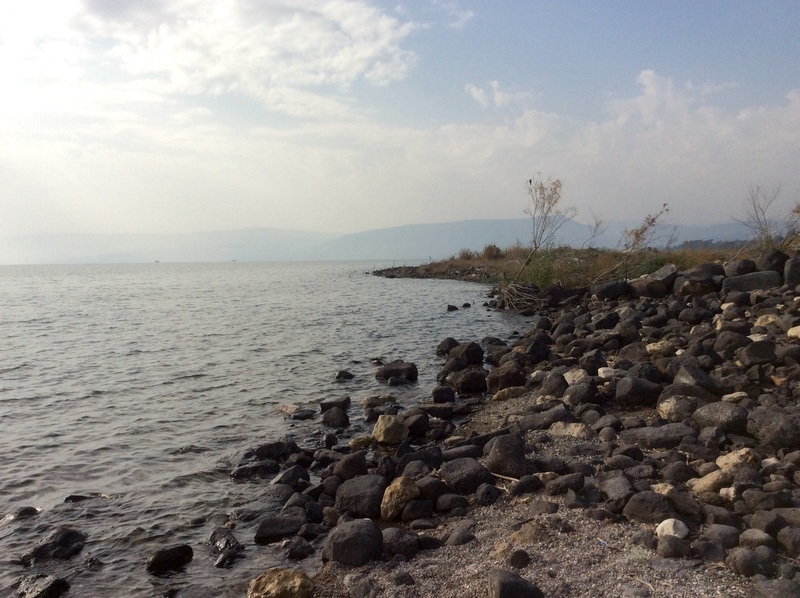 We are staying at the Karei Desche Guest house and Youth Hostel, right on the northern shore of the Sea of Galilee, which is not actually a sea, but a lake. There are teenagers everywhere. There is no actual town here, just the historical sites and ruins. 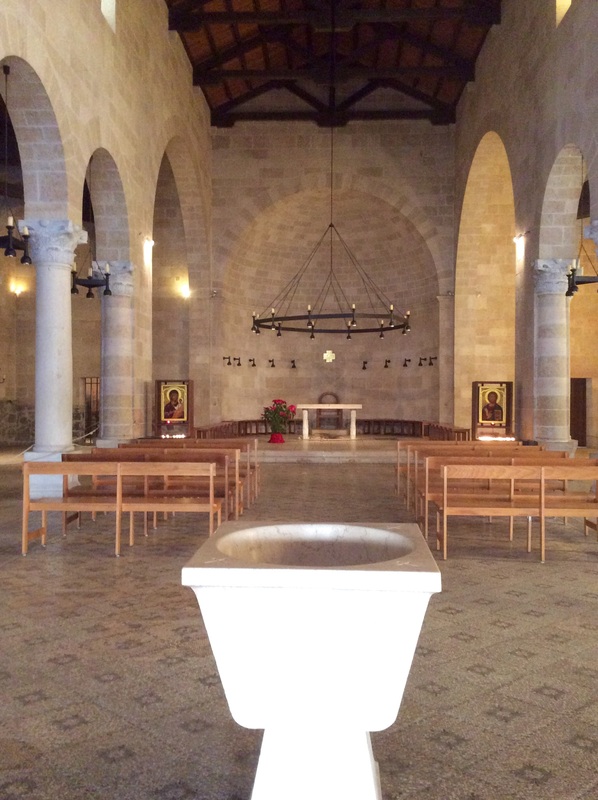 This is the place where Jesus fed 5000 with five loaves of bread and two fish. 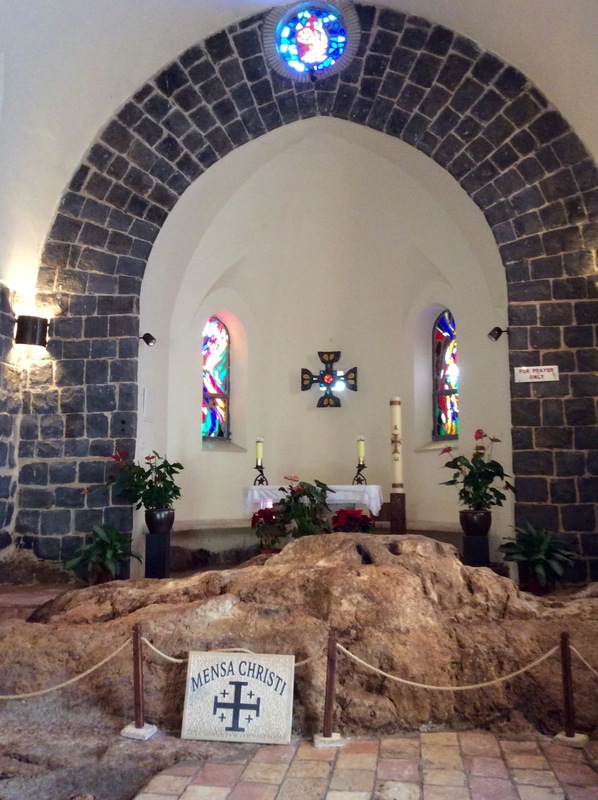 A church was built at the site in the 3rd century. The church was destroyed in the 5th century, and the remains excavated in the 1930s. This new church was built over the site in 1982. 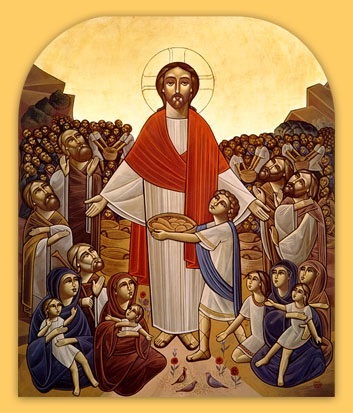 A mosaic of loaves and fishes was excavated next to a large rock, believed to be the place where Jesus blessed the food. 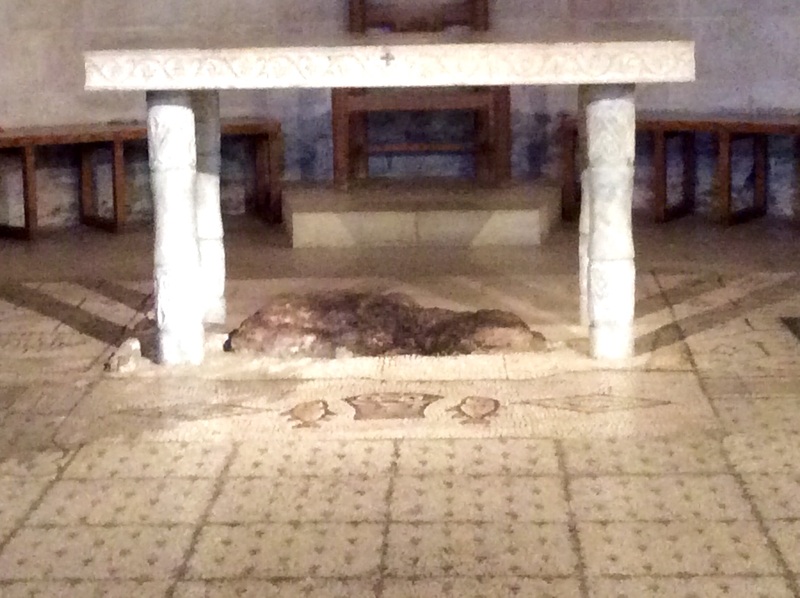 You can see the top of the exposed rock and the mosaic under the altar. 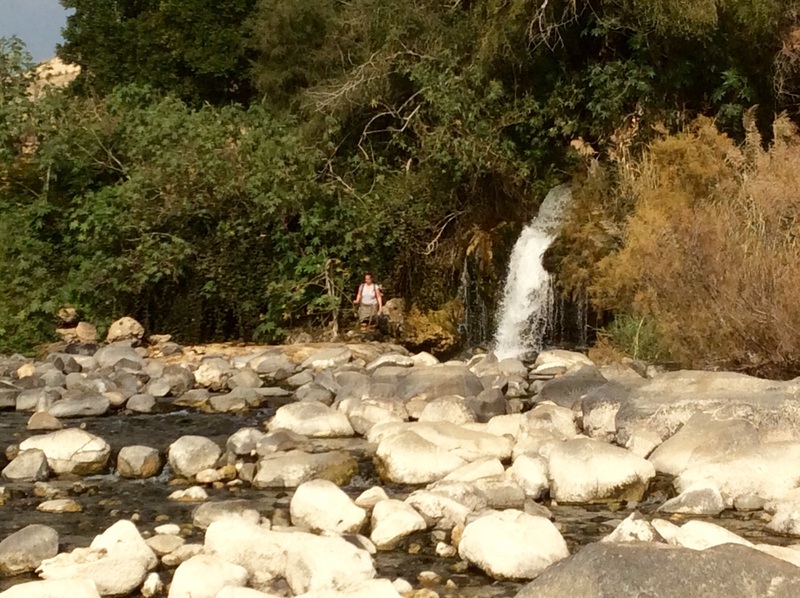 Nearby we found Job’s Spring, a sulfuric spring of warm water that cascades into the Galilee. Job was said to live in a nearby cave and bathed in the waters of the spring to soothe his sores. 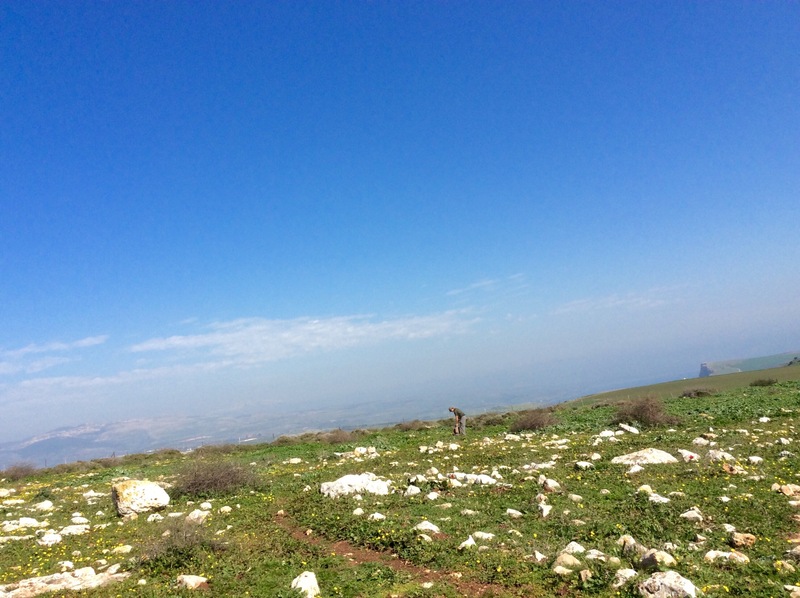 1/24 – Today’s hike takes us up and over the Horns of Hattin, an ancient volcano that now has two peaks that look like goat horns. Another gorgeous day. A lot of our path this morning was “sobriety trail”, so narrow that you have to walk it one foot in front of the other. Lots of rocks. We came across a Holocaust memorial and cemetery. 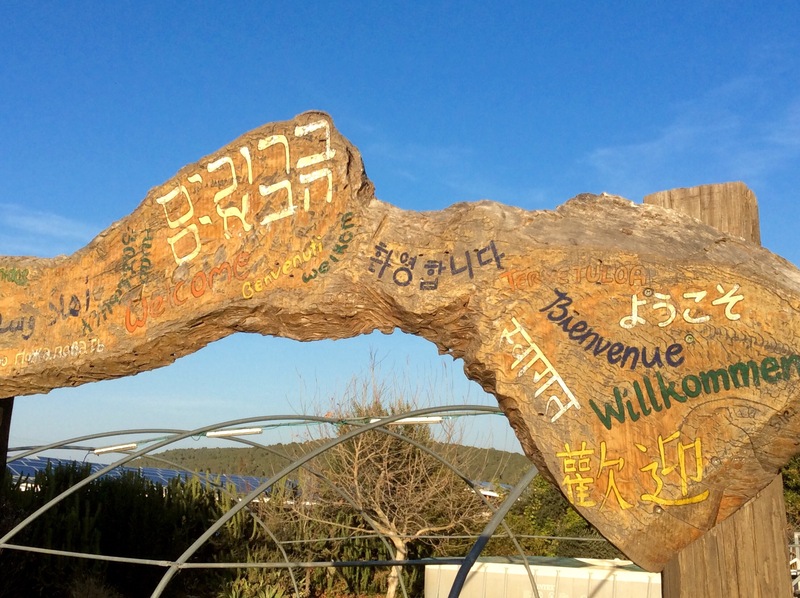 We ate lunch (goat cheese sandwiches from the farm) sitting at a brand new religious memorial with inscriptions in three languages, then made our final approach to the top. What did we find at the top of the mountain? 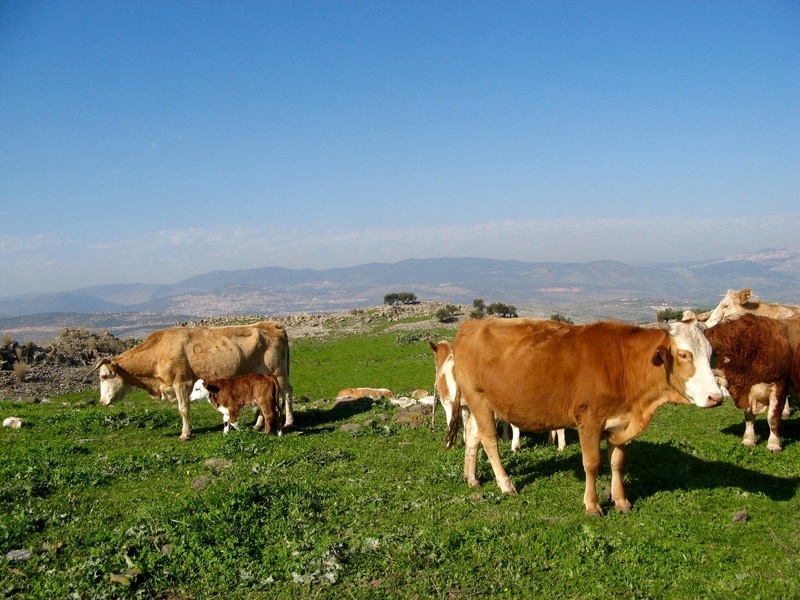 Cows! Wasn’t expecting that! 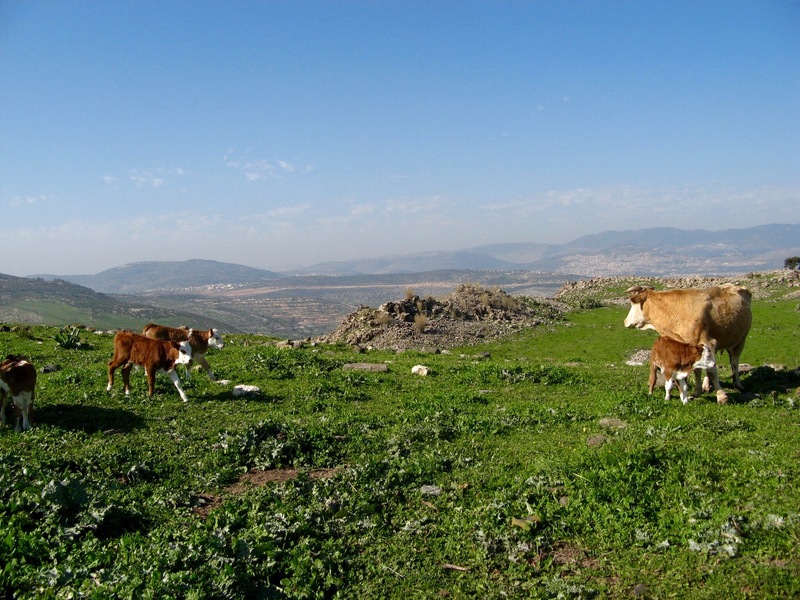 Do you think Jesus encountered a lot of cows when he walked over these hills? If you look in the lower right corner, you can see the memorial where we ate our lunch. 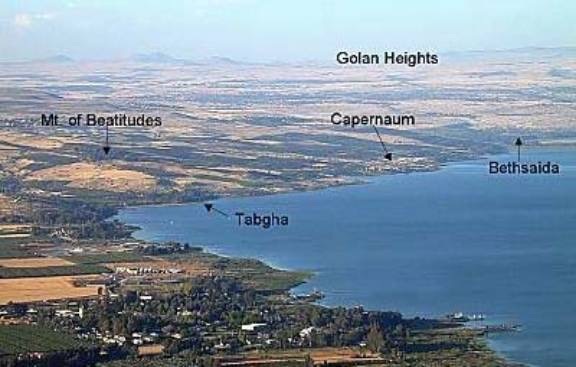 From here we can see the Sea of Galilee! The path down the other side of the mountain was even rockier than the path up. Did Jesus really do this in sandals? Happy to get off that mountain! 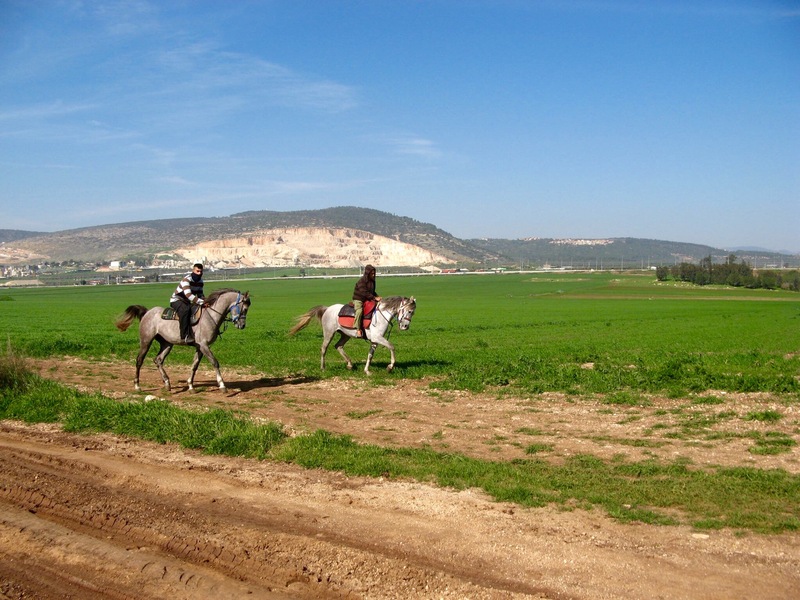 We were walking the final miles to Moshav Arbel, when a motorcycle pulled alongside us on the road. It was the son of our hosts for tonight, sent out to make sure we were okay and knew how to find the place. How nice! 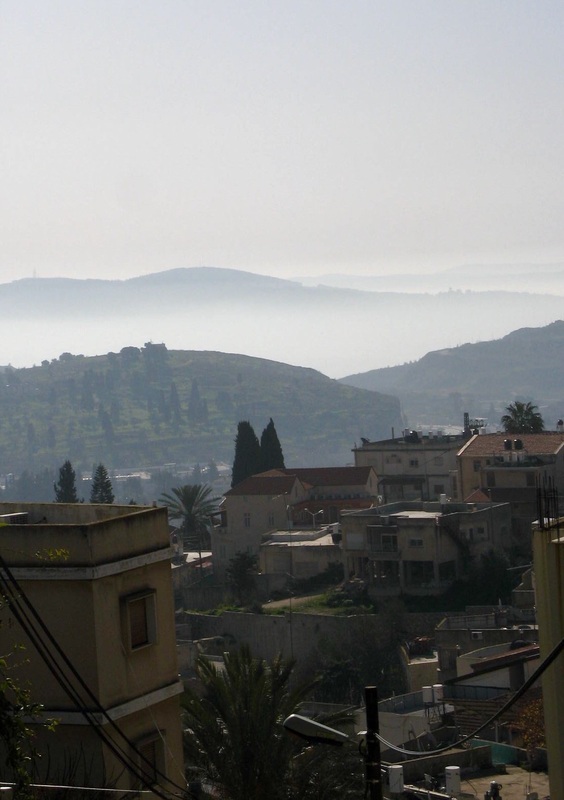 We were welcomed by Sarah and Israel Shavit at their family guesthouse, given a cool drink and shown to our own detached bungalow. A long, hot shower later, I started to feel like a person again. What a long day! 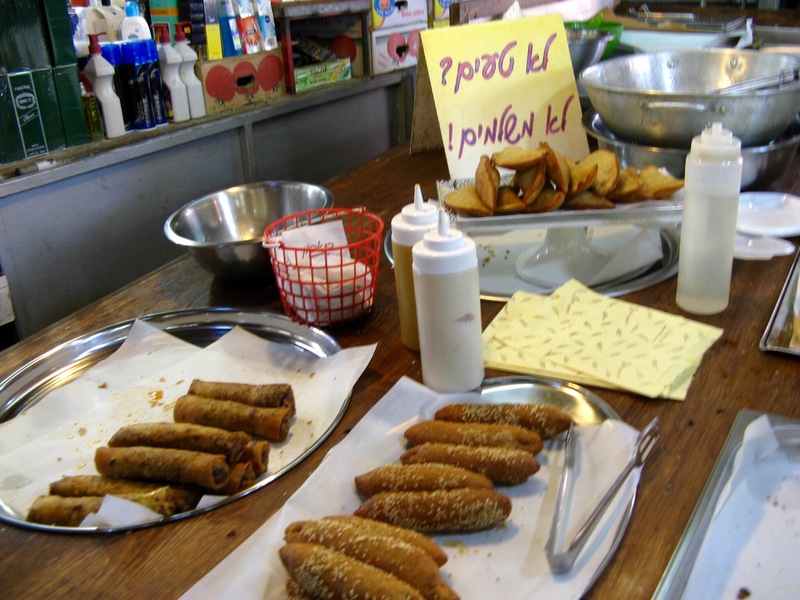 We went next door at supper time, and Israel handed us each a laminated menu for Israel’s Kitchen. We got to choose our entrees, which he then prepared at a gourmet level. The lamb casserole was to die for, served with all kinds of side dishes and salads. We could have had dessert, but I was stuffed. Then he brought out Limoncello, made from the lemons in his own garden. Heaven! 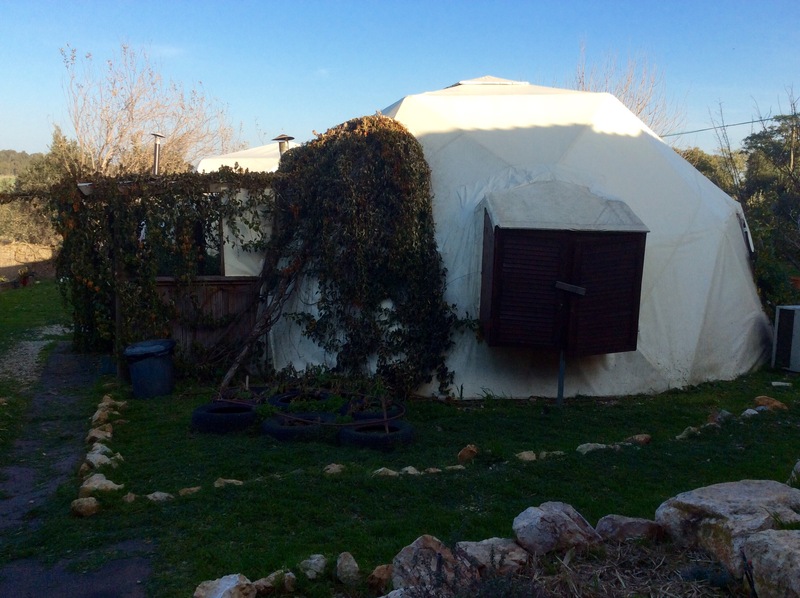 1/23 – We are prepared to walk 10 miles today, to stay at an Orthodox Jewish kibbutz hotel. However, it is Friday, and we can’t raise anyone on the phone to book a room. 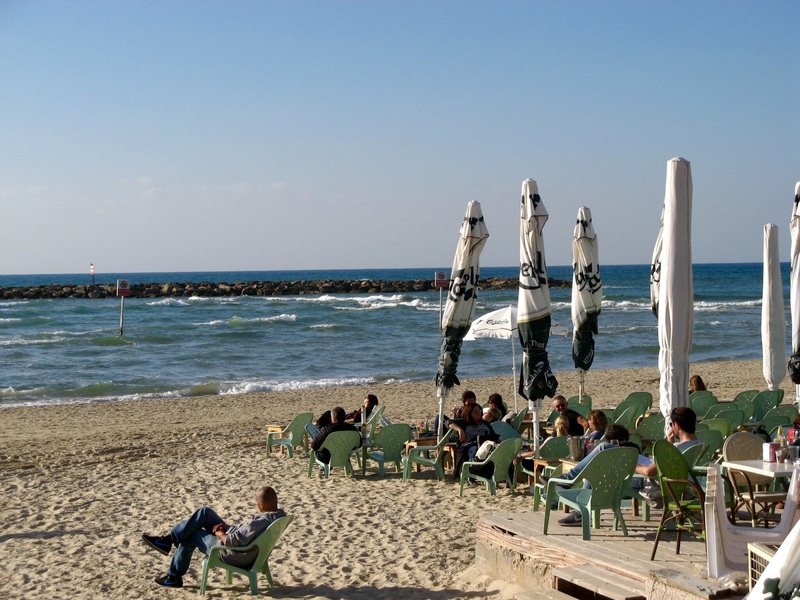 Our Cana host says that because of the Shabbat, we will not be able to stay there. I’m confused again, as I thought the sabbath didn’t start until sundown on Friday. Will try to find out more. So we adjusted our plan, and will trek today to Ilaniya. 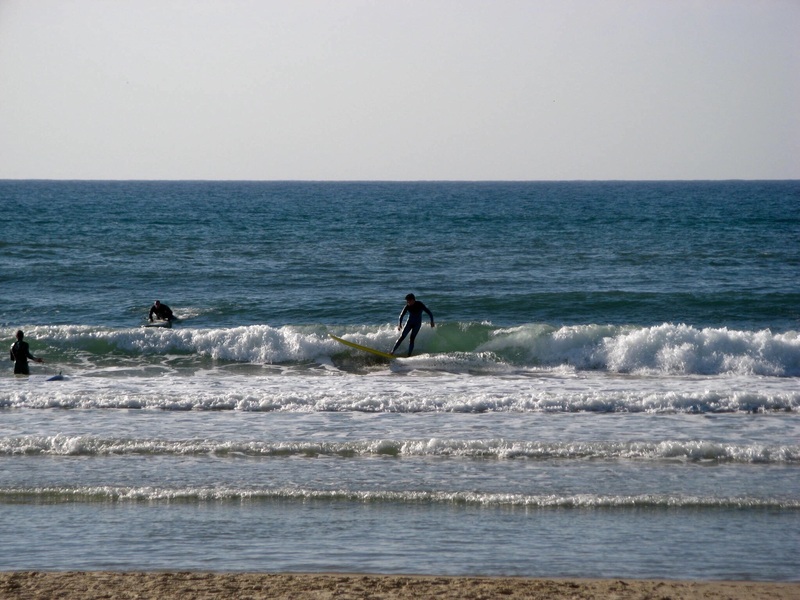 We picked a great week for weather, sunny every day, with temperatures in the mid 60s. Excellent hiking weather! 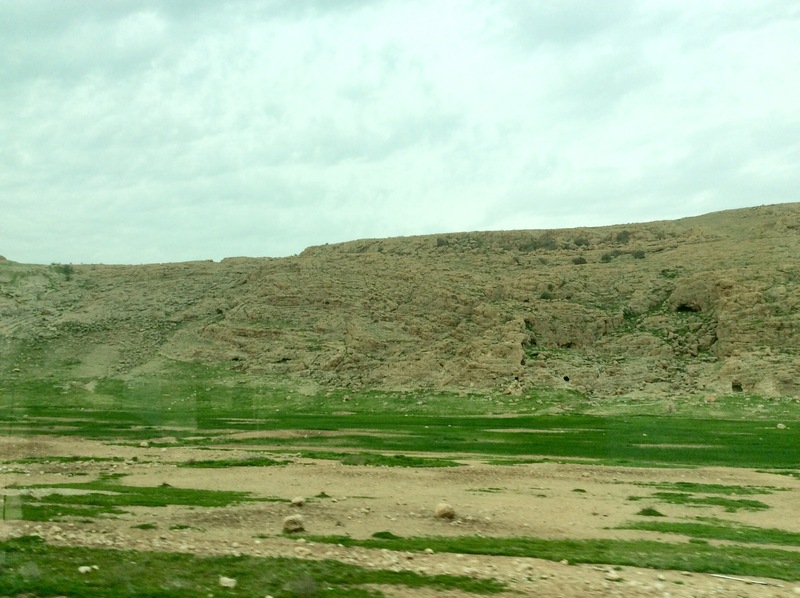 Our guidebook says that today we will be passing “depopulated” Arab villages. 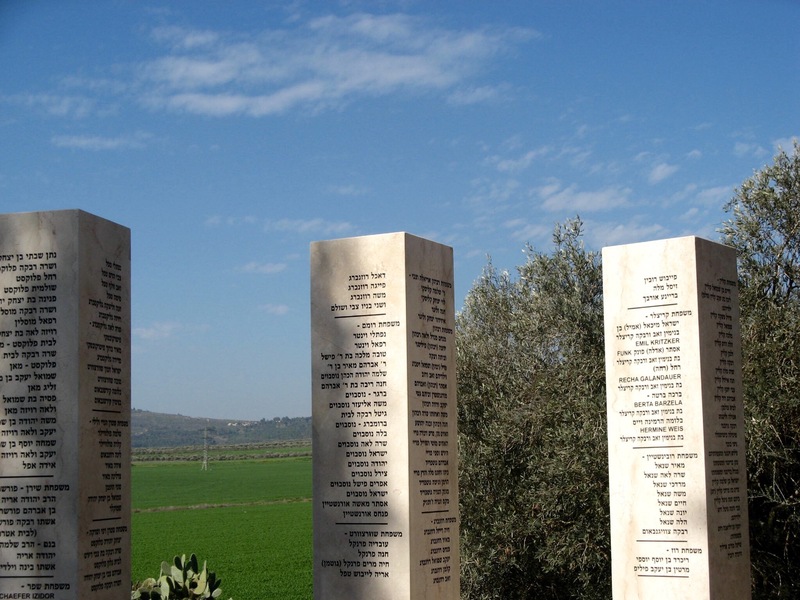 In 1948, when the Arabs were removed from their homes, the towns were blown up, knocked down, or bulldozed to assure that no one would try to return home. 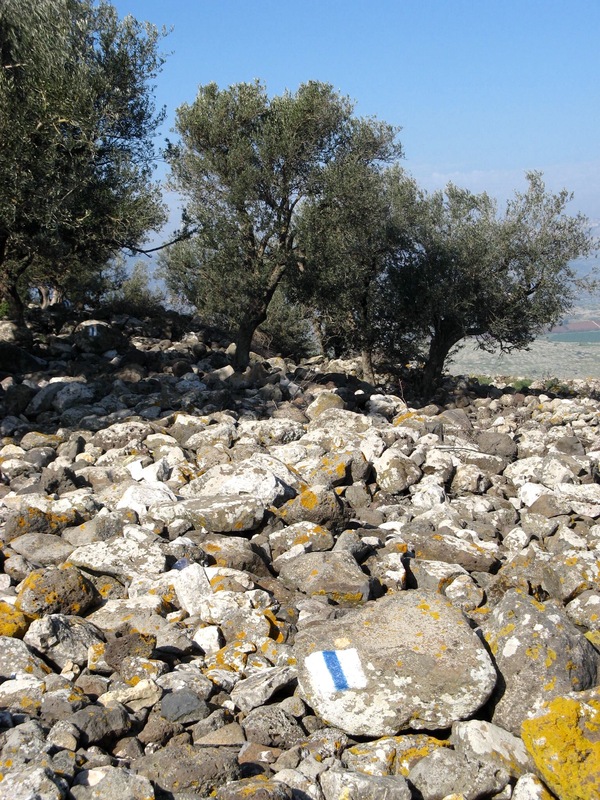 These villages look like piles of rock, with untended fruit or olive trees to mark where the villages once stood. We saw some horses today. These pix are for you, Mags! 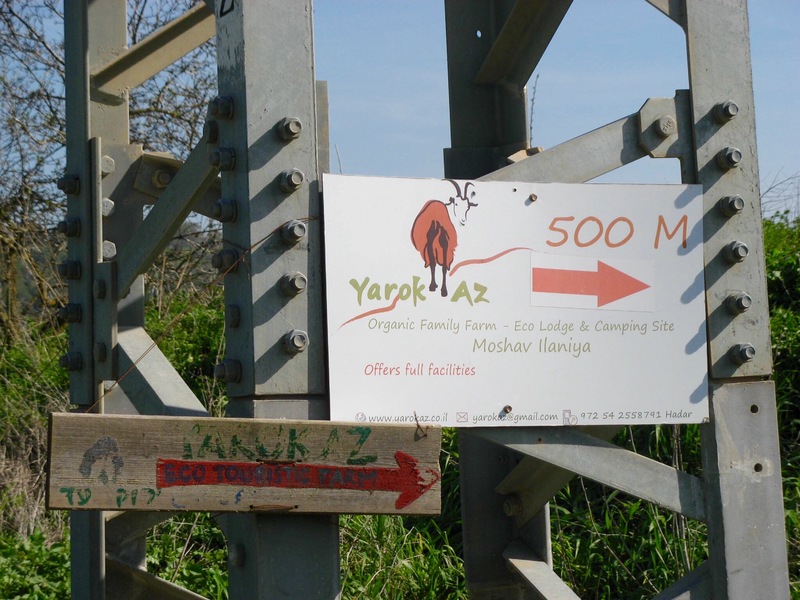 Almost before we knew it, we saw the sign for the Yarok Az Organic Sheep Farm and Ecolodge. 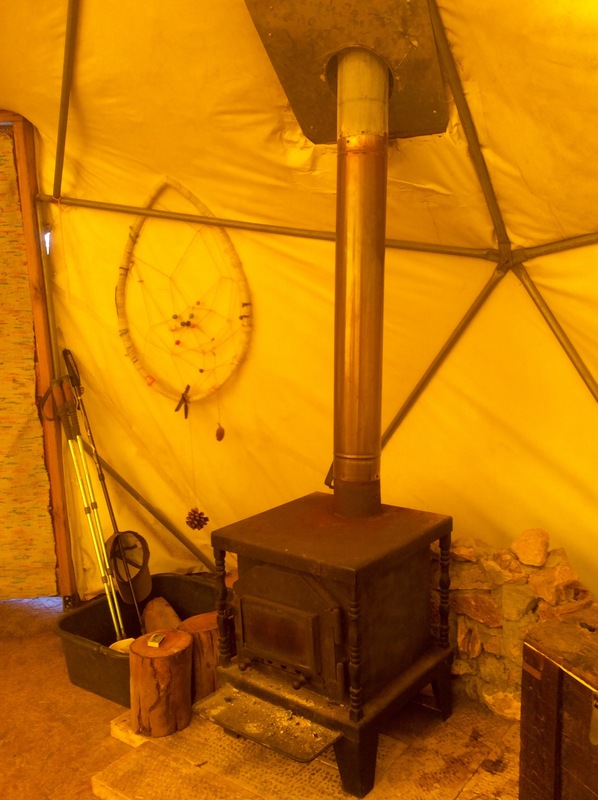 Our accommodation for the night was a canvas geodesic dome, with a wood stove to take the chill off the evening. Showers and (compost) toilets right outside. 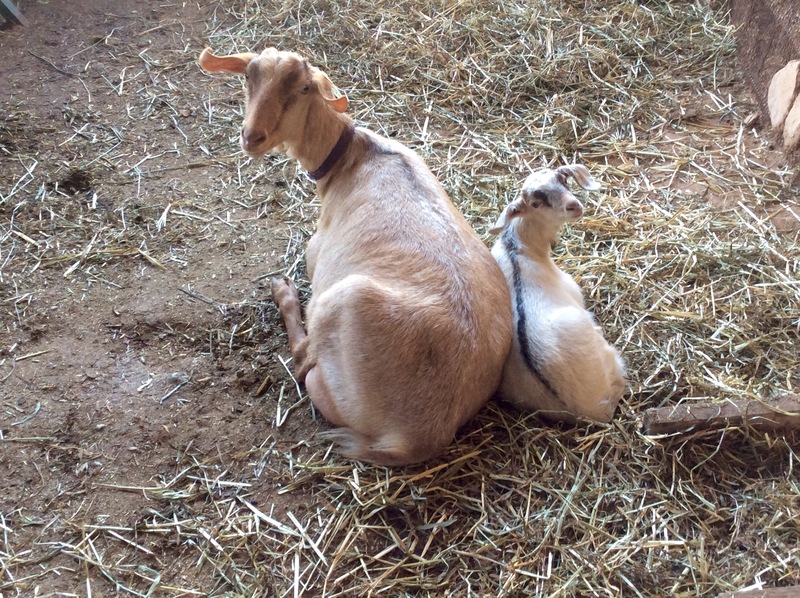 We washed our laundry and hung our clothes out in the sun, then went to visit the animals. 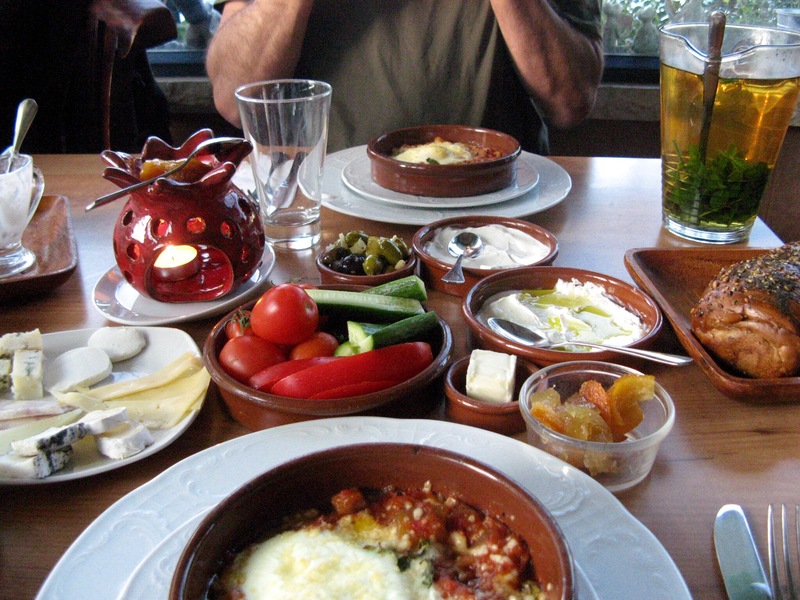 We had a wonderful vegetarian supper with goat cheese and goat yogurt. What a treat! 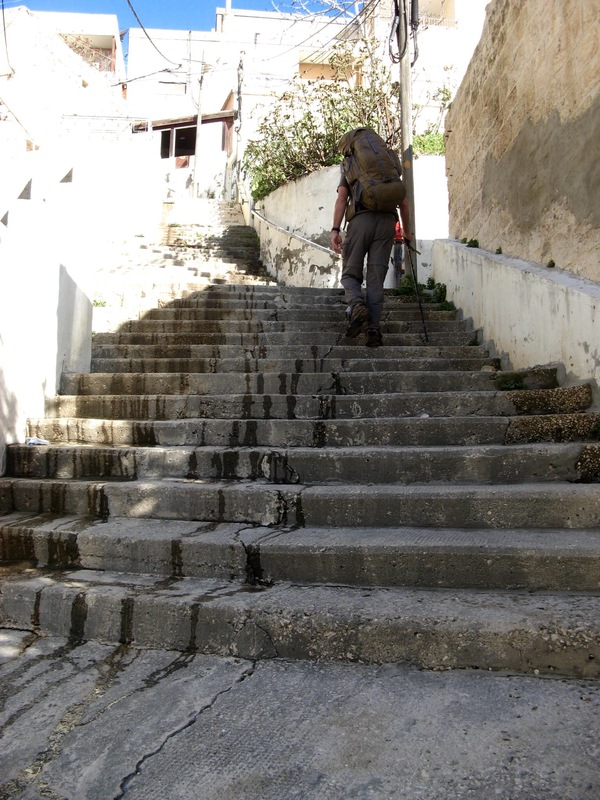 We ascended the 404 steps (felt more like 4004 steps) to leave the old city and start walking the Jesus Trail. 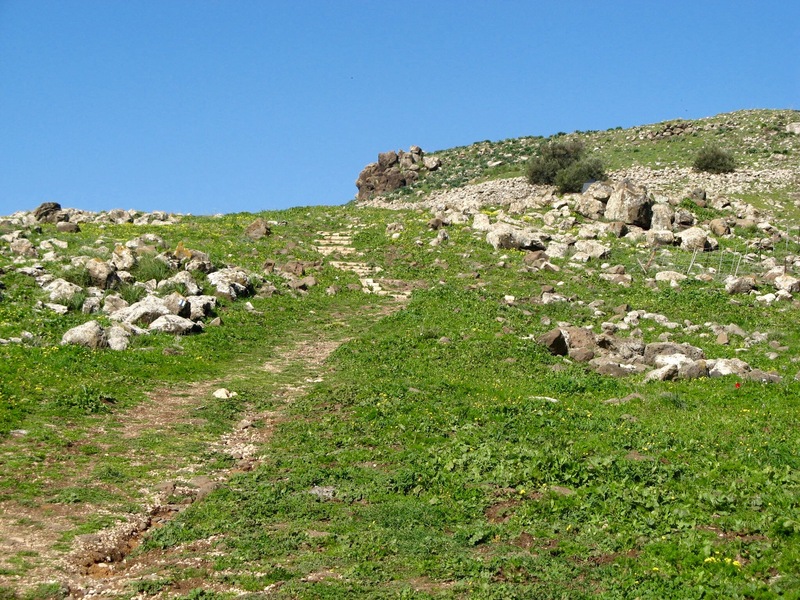 This trail was organized in 2008, to allow others to experience some of the areas that Jesus and his friends traversed during his ministry. 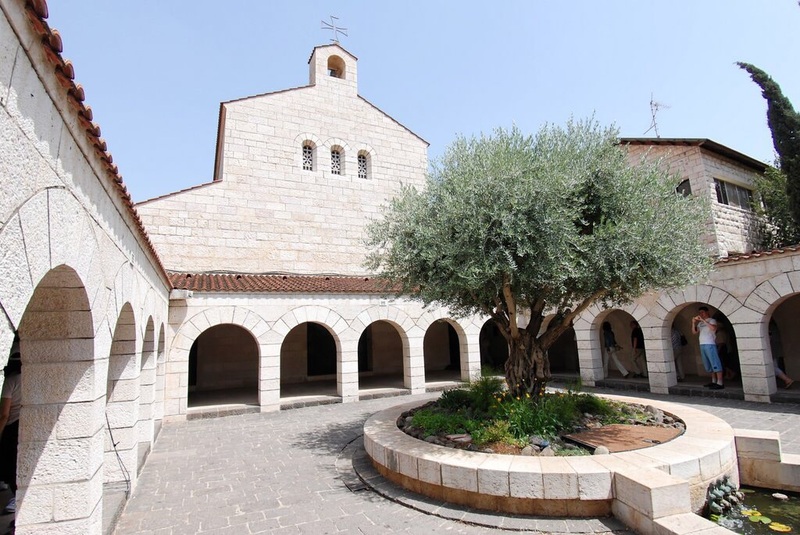 It also provides glimpses into the different cultures that share the Holy Land today. 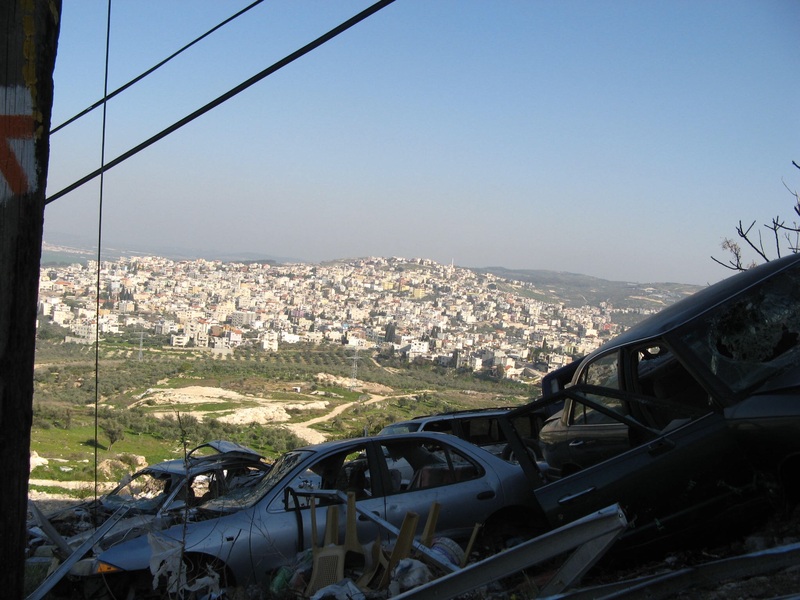 The more I learn about the Israelis, Christians and Palestinians in this place, the more confused I become. I hope I will continue to learn this week. 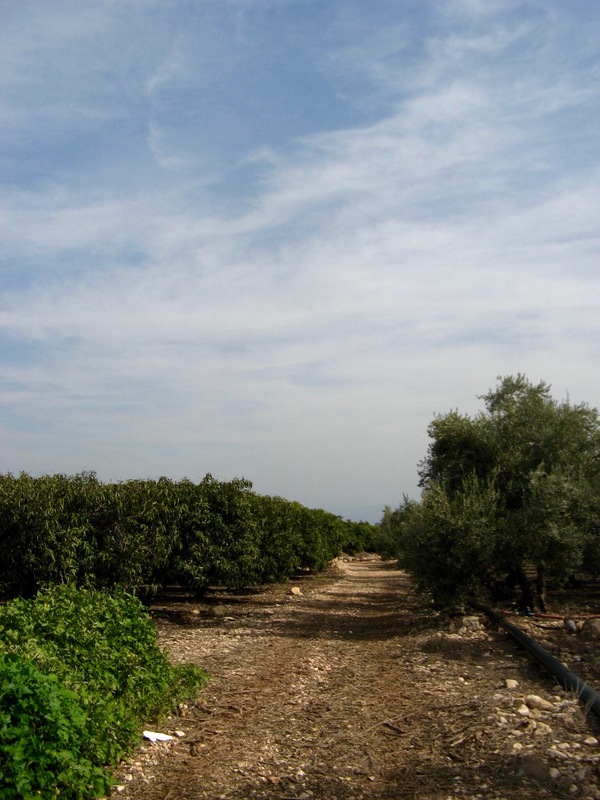 Today we will walk about 9 miles to the place that may have been the historical Cana, the site of Jesus’ first miracle. Like the sites in Nazareth, there is a dispute over where this may have happened. 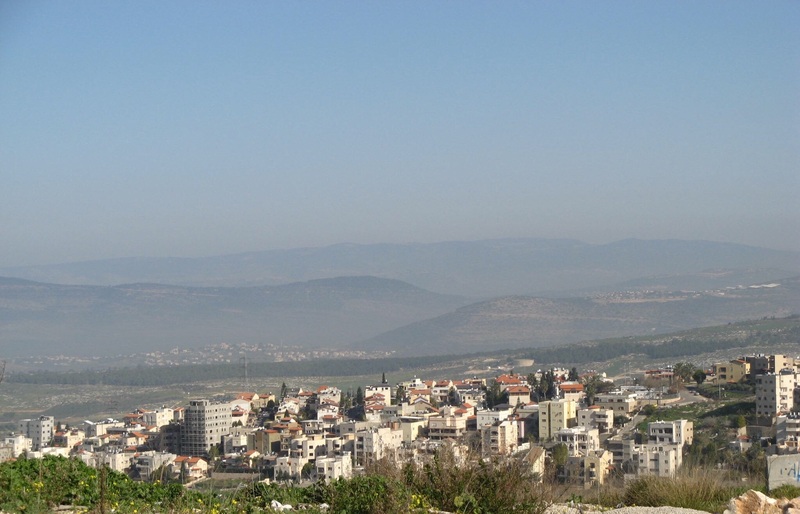 The view from the top of Nazareth was worth the climb. Once out of the city, we left the road for a series of farm paths, with poppies in bloom. By lunchtime we reached Zippori National Park, which contains ancient ruins of what was once Sephora. 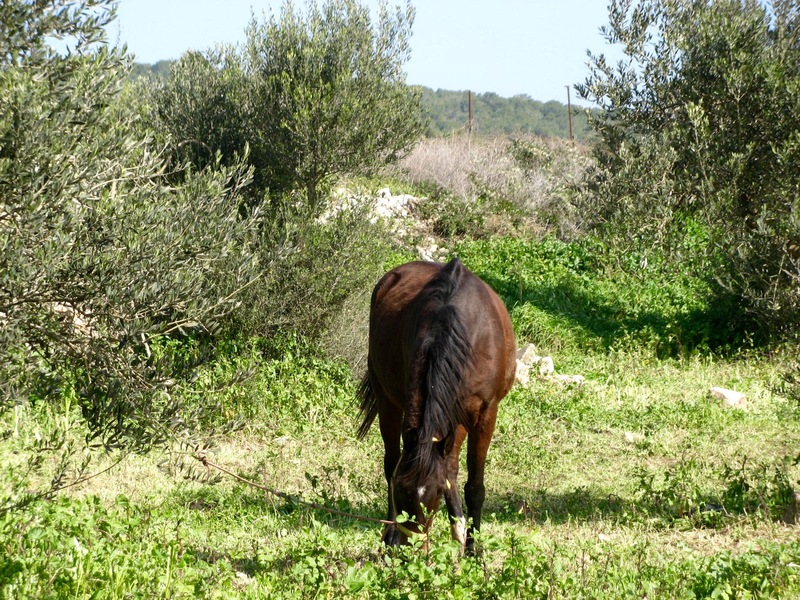 In the forest, we passed cows, as tall as horses, grazing. I know they don’t look it without context, but believe me, these cows were BIG! See the two brown horses to the right? Same size as the cows! In the afternoon we came to the Arab town of Mashad, where we stopped to talk to a friendly young man. When he asked where we were from, we said, as always, America (we get blank looks when we say US or USA). Ah, he said, California? 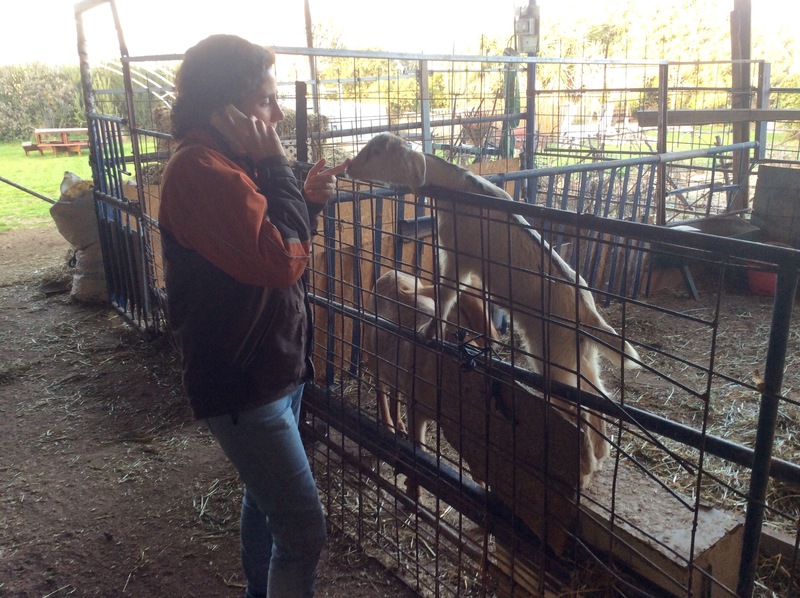 Close, I replied – Virginia! Oh no, he said, Virginia is not close to California at all. It’s on the other side of the country. 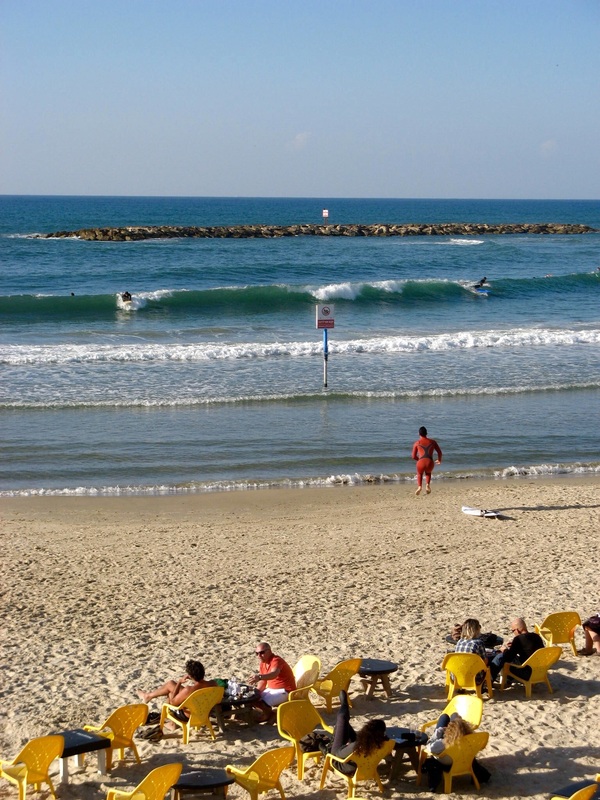 Now, show of hands, folks: how many of you could tell the relative positions of any two cities in Israel? The rest of the world know much more about us than we know about the rest of the world. While we were speaking, children were walking home from school, shouting Hello! to us. A little boy ran up and gave us high fives. 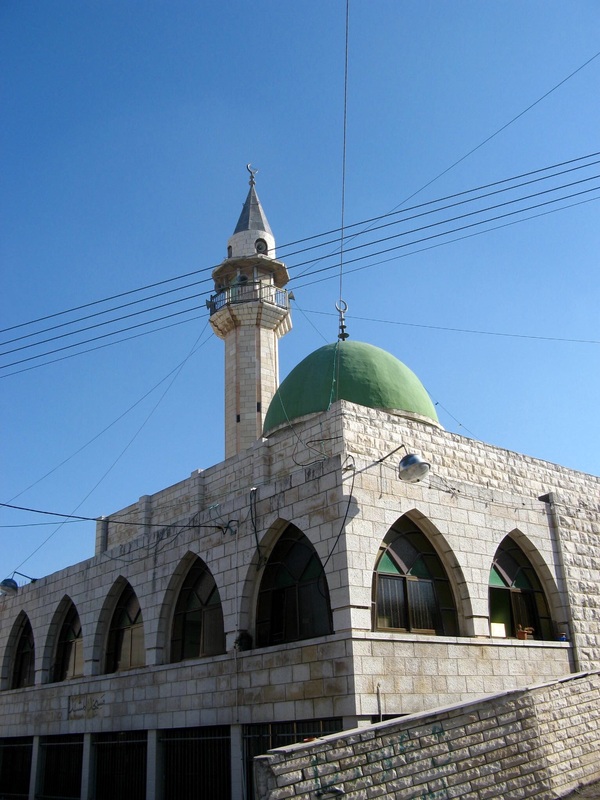 Our new friend pointed out this mosque, which may be the burial place of the prophet Jonah (Ninevah also claims Jonah’s tomb). Remember that Muslims share all the Old Testament prophets with Judaism and Christianity. As we left Mashad, we could see Cana in the distance. Here is the picture I will show you. I realized that I’ve been shooting “up” all day to avoid taking pictures of trash. I’m not into shaming countries for their litter, but this place has more trash in the woods, in the fields, by the roadside, an especially on marked trails, than any place in recent memory. We’ve been walking by sofas, cars, washing machines, a bathtub, and tons of plastic that will never decompose. I just had to get that off my chest – I’ll continue to look for beauty whenever I can. 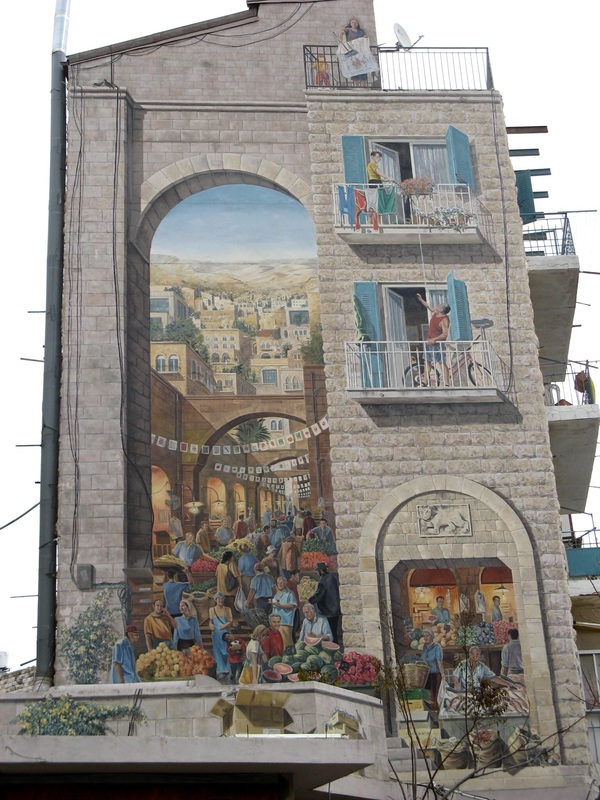 And now we are in Cana, otherwise known as Kfar Kanna. 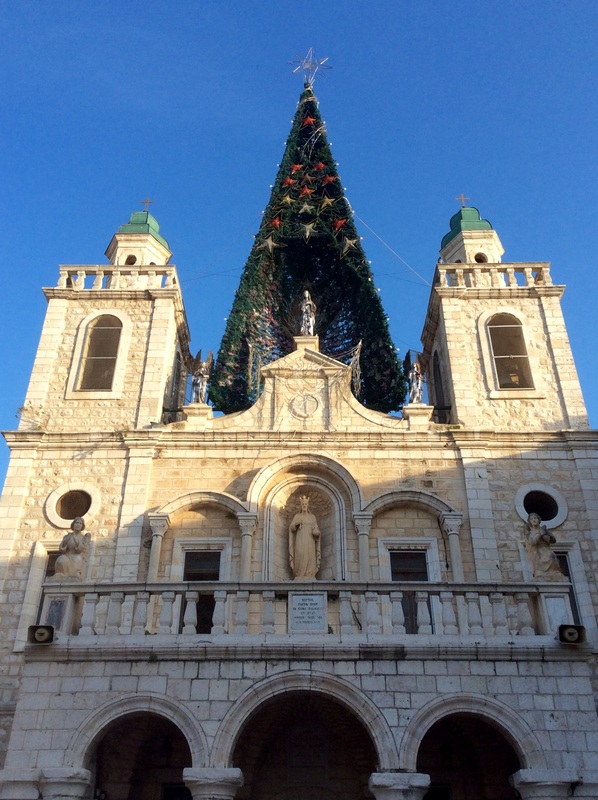 As we walk into town, we pass the Greek Orhodox Church where Jesus turned water into wine to make his mother happy. Two blocks away is the Franciscan version of the same church. 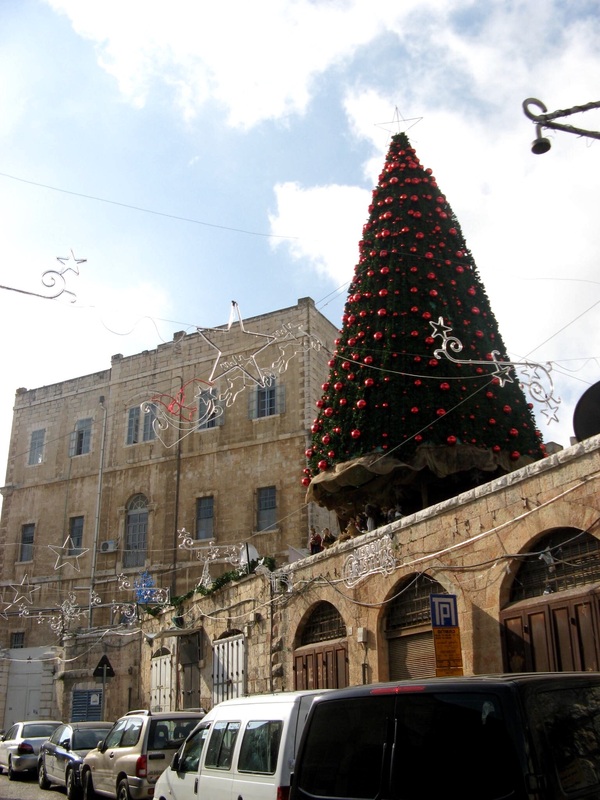 Remember how much Nazareth likes Christmas? So does Cana! In addition to the big tree, the streets are still lined with multi-colored Christmas lights. Very festive! 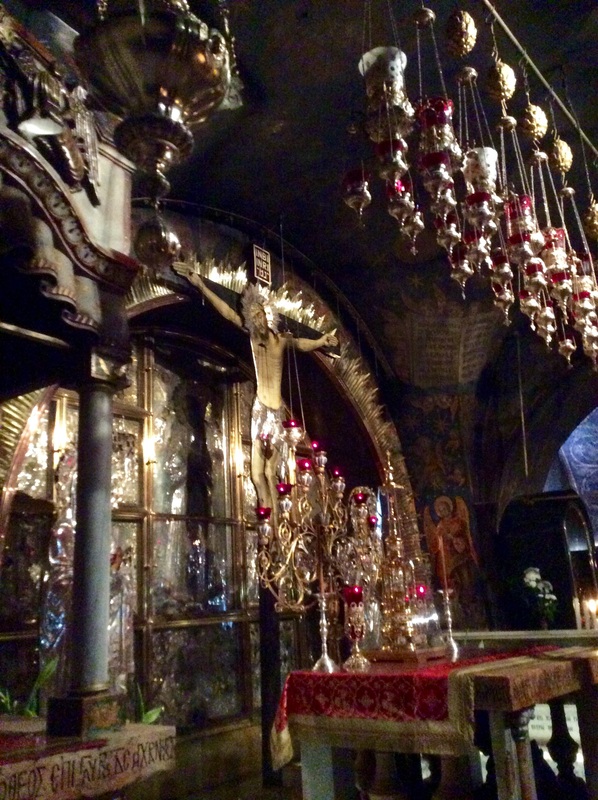 The Greek church is not open to visitors, but we check out the Catholic one. 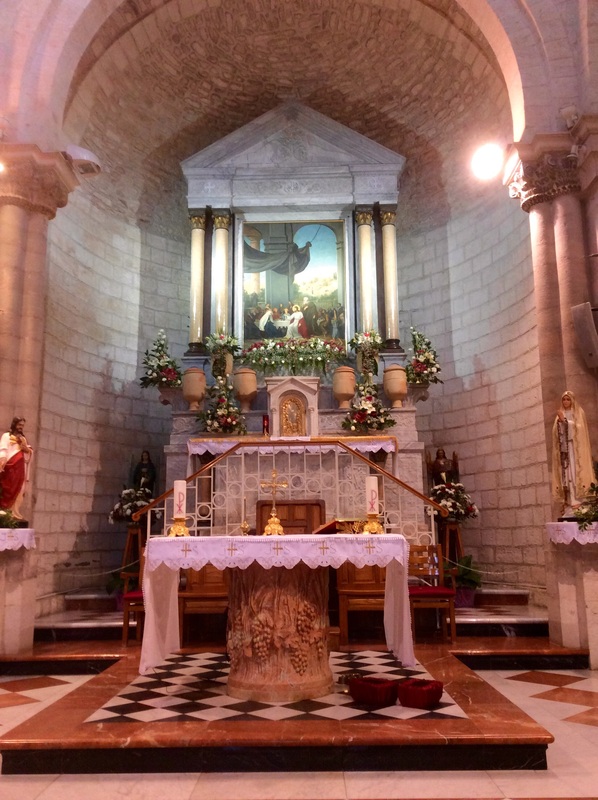 Note the grape motif on the altar. 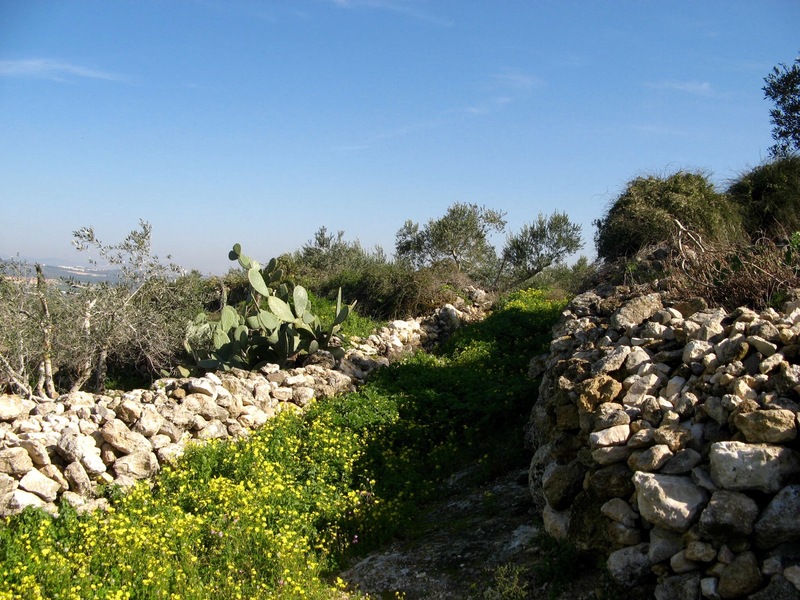 Below the modern church is an excavation of a previous church, and relics found there. Prayer requests and money are thrown down the excavation too. In pride of place is a huge cistern that can hold 80 gallons of water. This is one of the “jars” from the Wedding at Cana. It is huge! 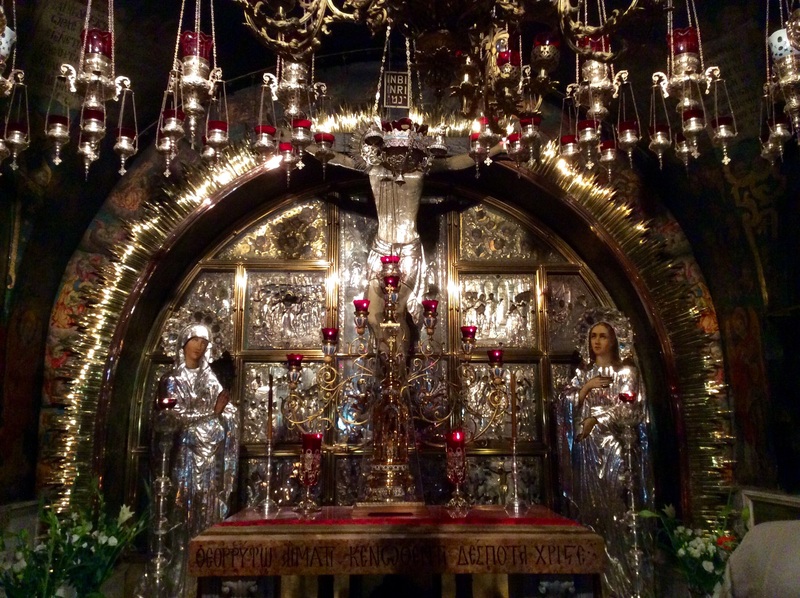 There are different jars on display at the Greek church – you decide! 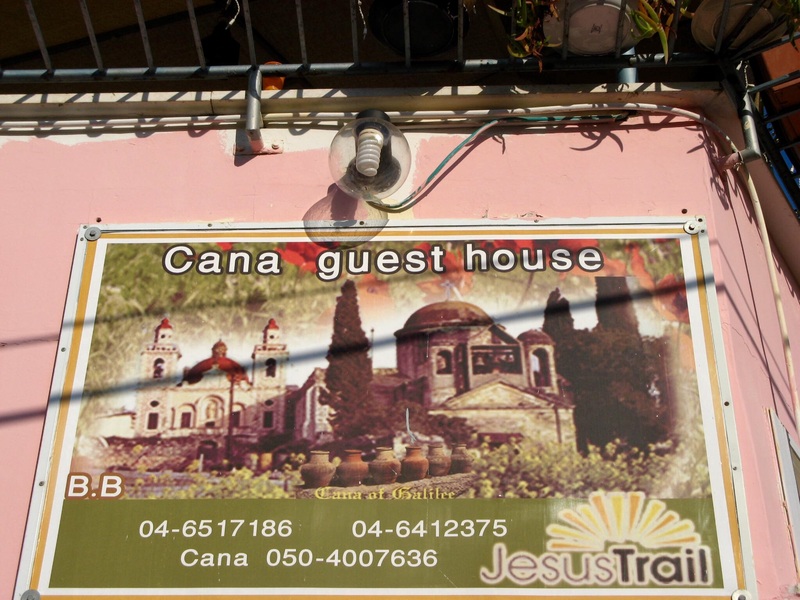 We are staying at Cana Wedding Guesthouse, run by a Christian family. The mother has little English, so our conversation is limited. The mother says that in the spring, the town is filled with couples who come to renew their wedding vows at the church. We have supper at the son’s pizzeria in town (pretty good NY pizza! 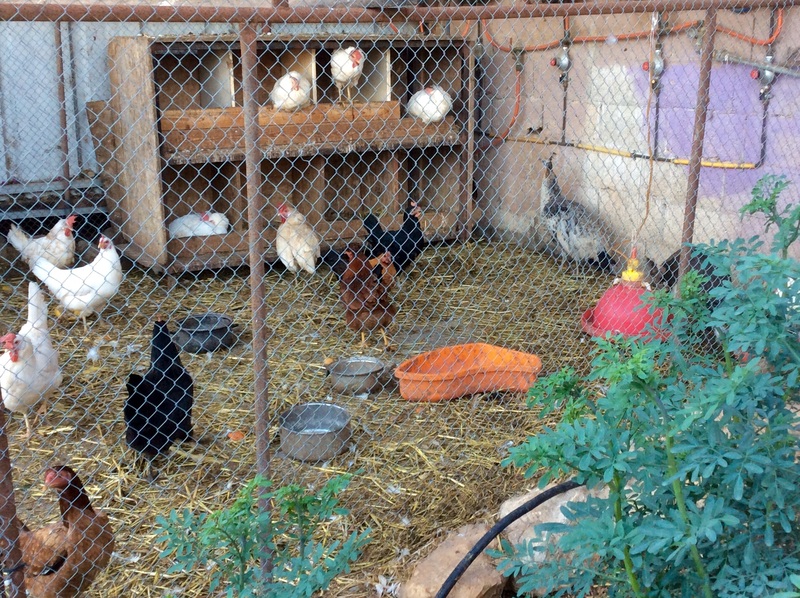 ), and the family will feed us breakfast in the morning. We are the only guests.